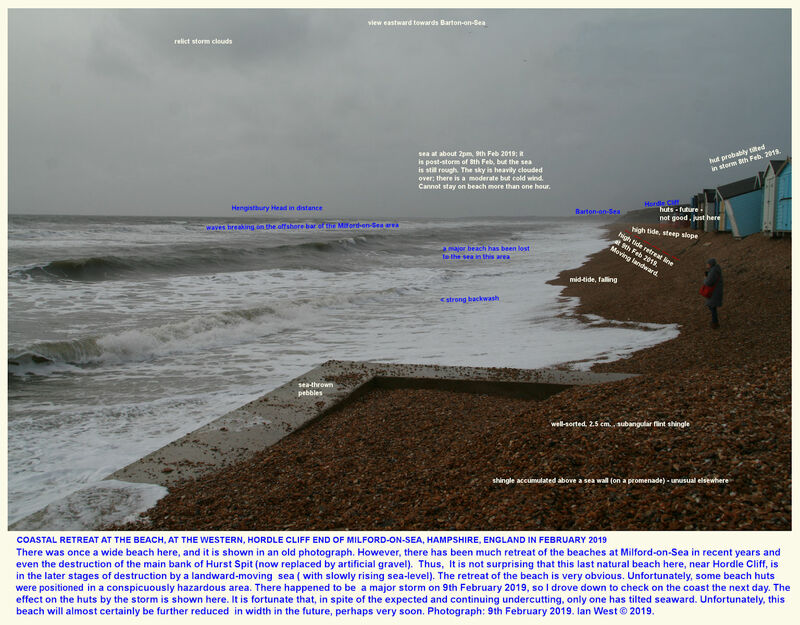 INTRODUCTION TO THE MILFORD-ON-SEA WEBPAGE. The coast at Milford-on-Sea is discussed here separately from Hurst Spit - but please see the Hurst Spit webpage. In the past this small Milford urban area had a shingle beach in front of it. 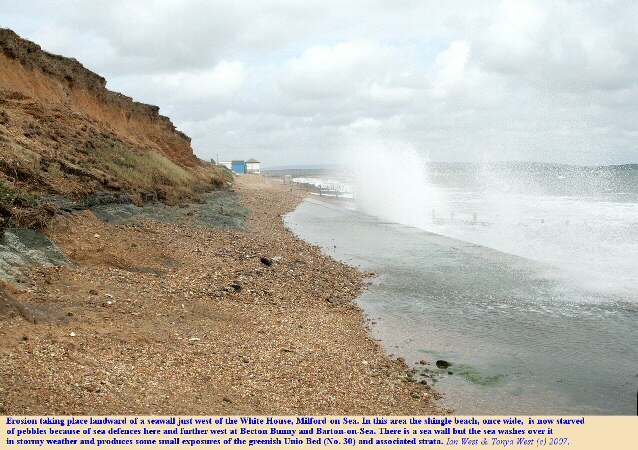 This beach was continuous with Hurst Spit and with the beach to the northwest at Hordle Cliff. 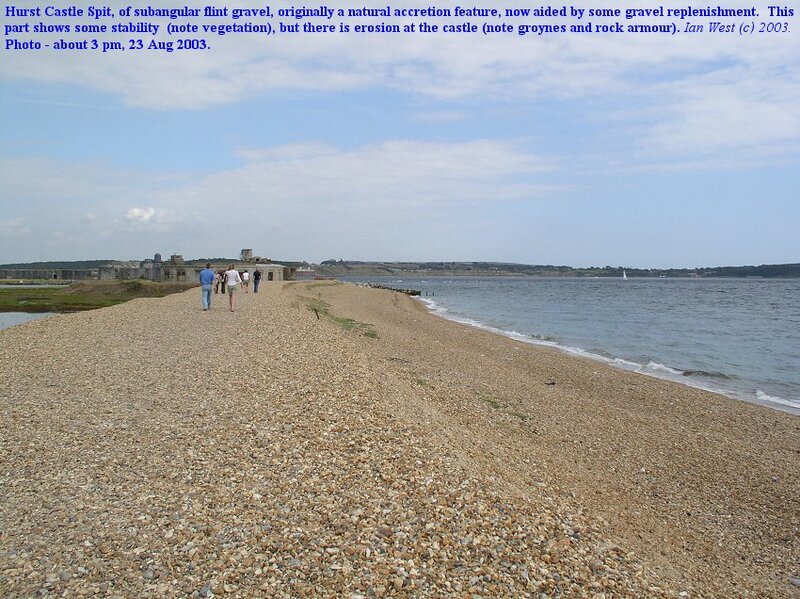 It was, therefore, a natural piece of coast and part of the supply connection to Hurst Spit. There was no major problem. Now, because of a combination of natural retreat and the effect of specific, fixed, coastal protection for particular buildings and areas, the coast of Christchurch Bay is very irregular. 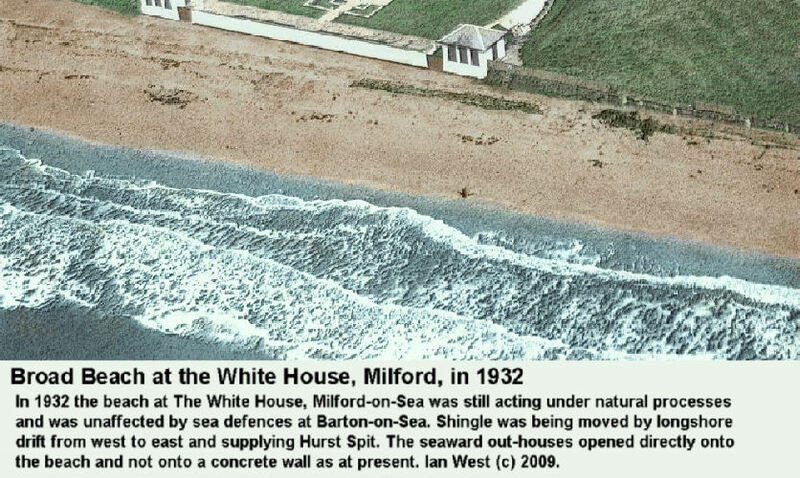 Years ago, both the White House building at Milford-on-Sea and the main sea front were originally at the back of a good and regular shingle beach, as shown in old photographs. Changes have occurred and eventually there may be increased conflict between natural retreat and artificial structures. Understanding the matter is not simple. 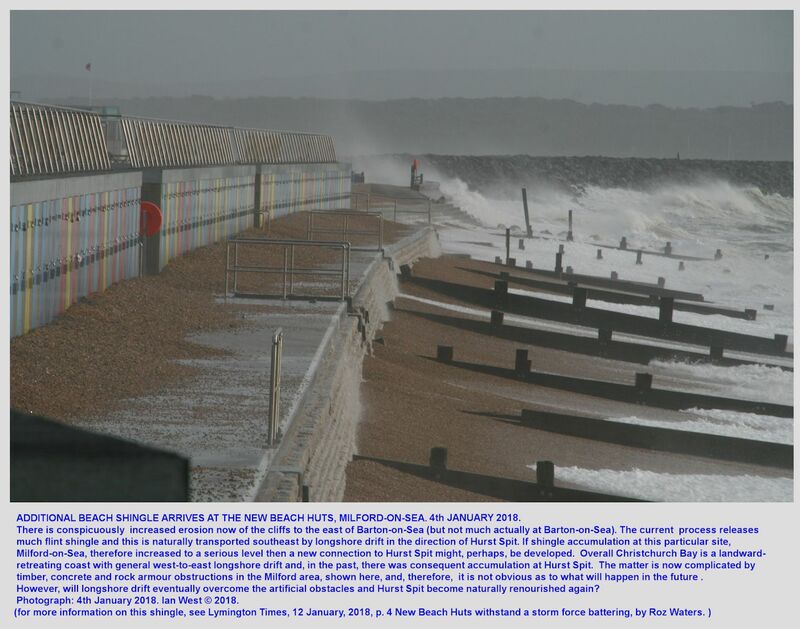 The eastern end of the Barton Sea Defences is causing some effective, clockwise coastal rotation, further east at Hordle; this rotation is also affecting beach alignments specifically at Milford-on-Sea. The landward end of Hurst Spit is, in any case, very complex. 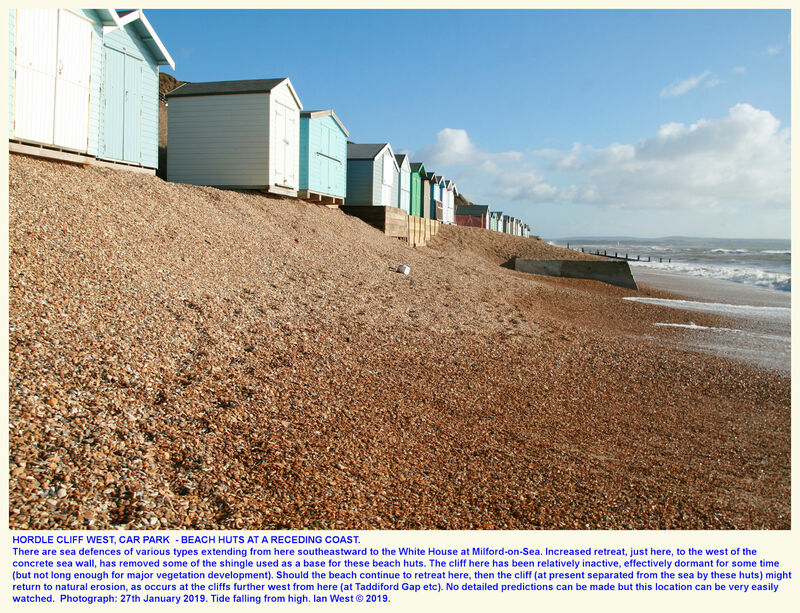 In January, 2018, and still there in December 2018,there was some shingle accumulation accretion at the main, Milford-on-Sea promenade, and also at the new concrete beach huts. The medium-sized, flint pebble shingle has been thrown up by occasional phases of storm waves. It is the indirect result of increased erosion east of Barton-on-Sea at Becton Bunny (Barton Golf Course) area and at Hordle Cliff nearby. 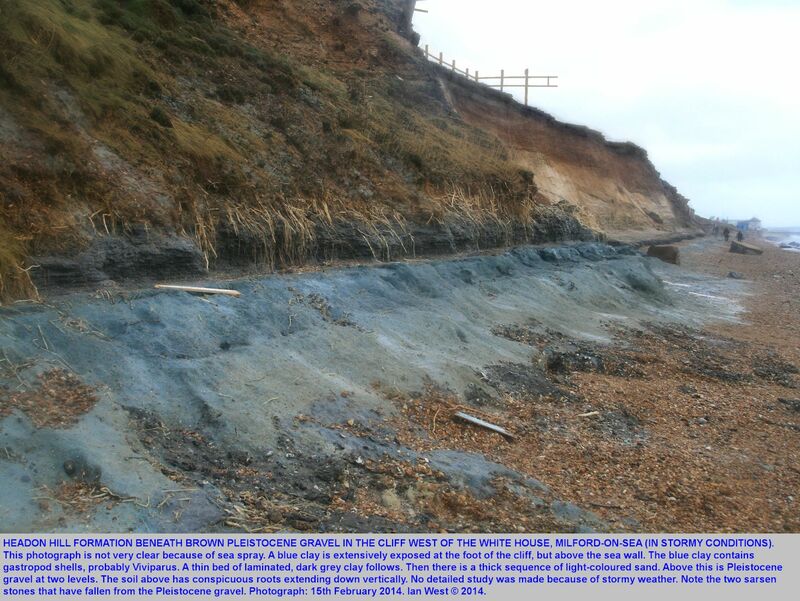 As long as this process continues or even increases the supply system to Hurst Spit might retart. 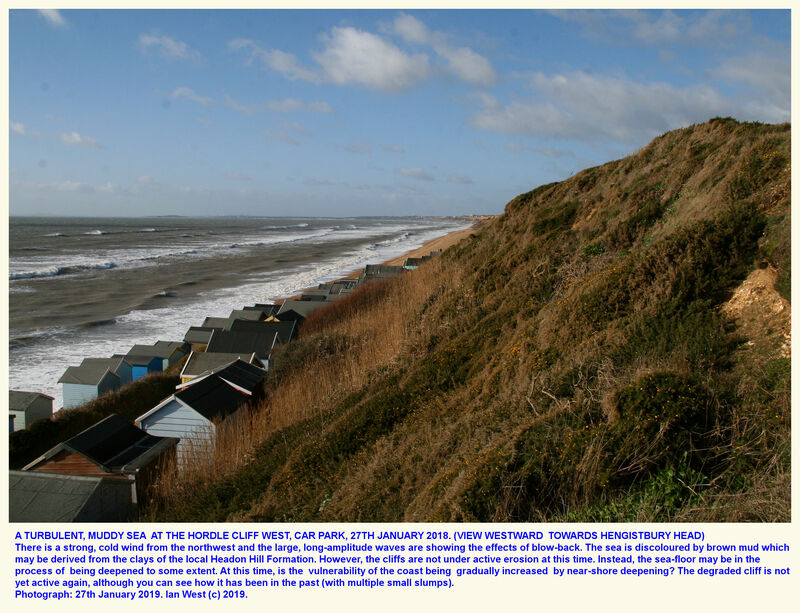 It would be complicated by the various sea defences, including concrete walls, rock armour and old timber groynes in the Milford area, but there a possibility of some longshore drift from the area to the east of Barton-on-Sea to Hurst Spit. Sea defences at Milford-on-Sea may slow the natural shingle transport in places but it has not completely prevented the natural shingle transport to Hurst Spit. Was has happened is that buildings and promenades have been constructed over the years without allowing for natural retreat of the coast. 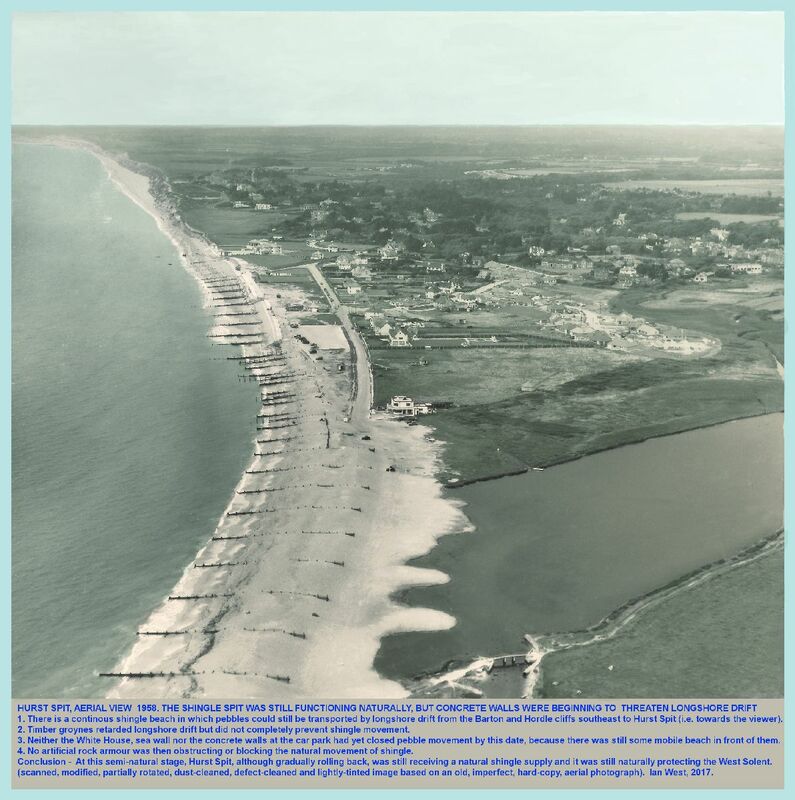 There was once a good, continuous beach almost all along Christchurch Bay (see the old photographs) with much beach shingle and sand to the seaward of the White House at Milford. When this building was constructed there was probably little thought that this could be a coastal barrier almost preventing longshore drift and pebble supply to Hurst Spit. 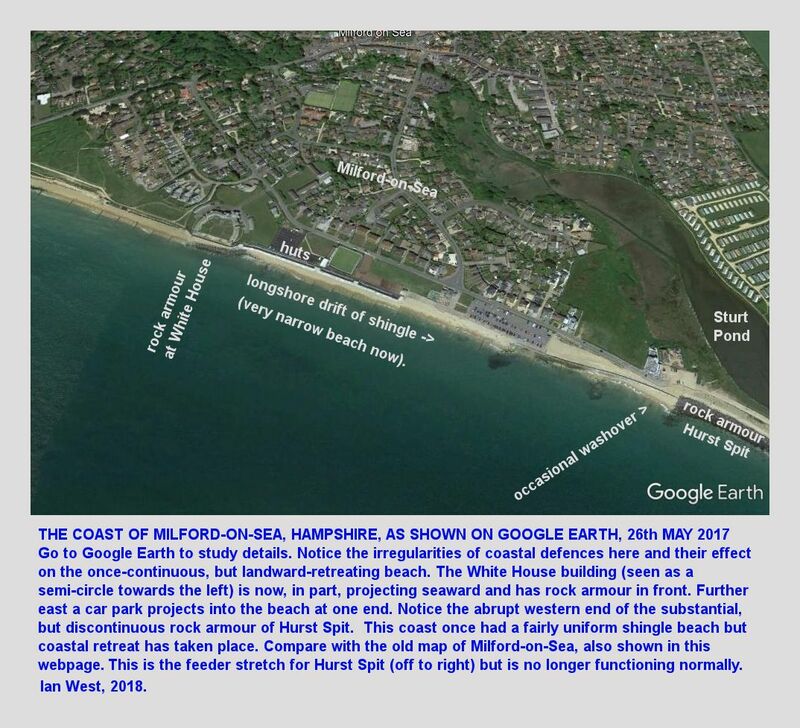 Another complication is that probably the concrete sea front at Milford-on-Sea might be too far seaward. If you look at this area on Google Earth you will notice the rather irregular and piecemeal sea defences, although it must emphasised that there is not suggestion here of a continuous, high ugly barrier! It is just that natural processes, including recession, have been stopped by varied and irregular manner sea defences at specific point. 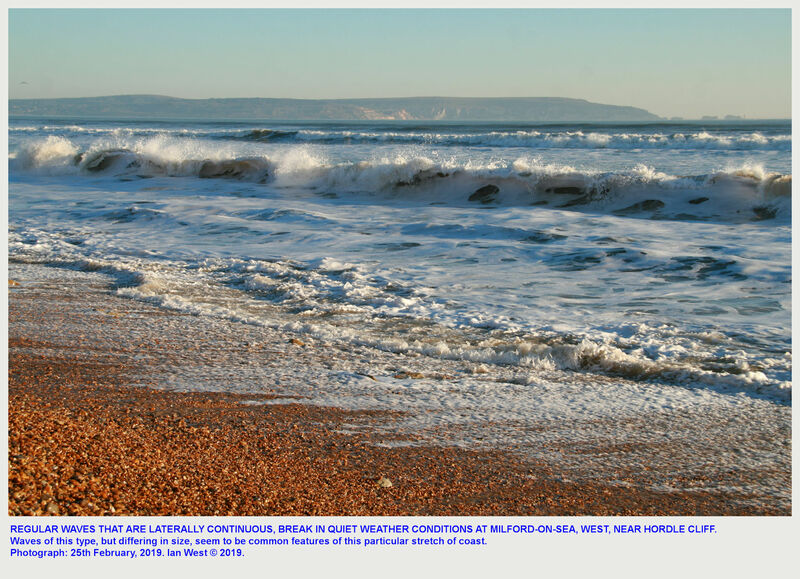 The shingle beach in front of Milford-on-Sea is now very narrow and, in particular, very irregular. The coast should normally move landwards to some extent as a natural result of coastal erosion. However here it has been barred by concrete sea defences and larvickite rock armour at the landward end of Hurst Spit. If the area had been left in natural conditions there would have been a good continuous beach. However, there are houses there now that are well-separated from the sea by car parks and greens and so protective works are serving a purpose. 1. Obstruction of natural beach transport by rock armour to the west of the White House. 2. Major obstruction by rock armour at the White House; and note that the southern part of the building projects seaward into the beach and there is much obstructive rock armour. 3. The main sea front at Milford-on-Sea is very irregular (with a car park projecting into the beach, and with a landward curving, sea wall (the main overtopping site) near the cafe (once with major flooding) to the southeast. 4. Then comes the larvikite rock armour, which is suprisingly high and it stops at relatively low seawall near the cafe (not on high ground). 5. Further southeast, beyond the fairly short but high barrier of rock armour the spit is consists of shingle which sometimes has to be replaced, at least in part, after major storms. Coast Erosion east of the White House, Milford-on-Sea. 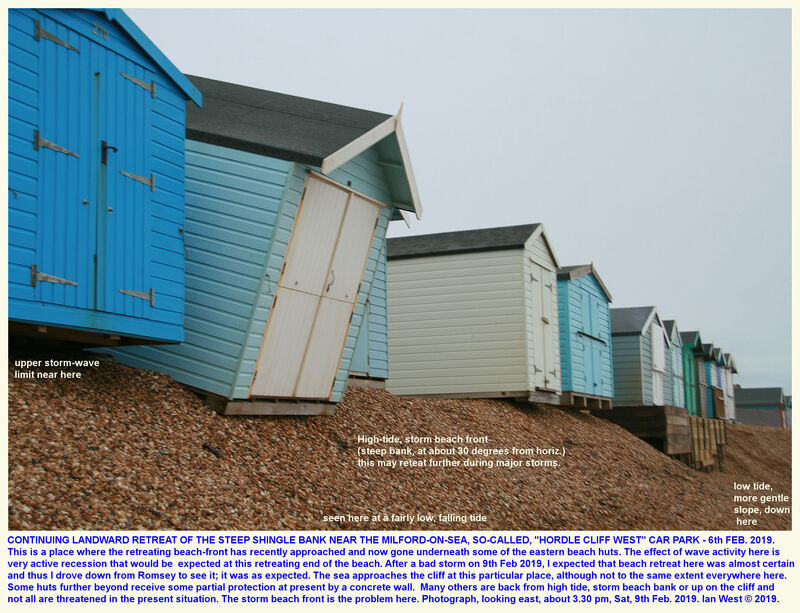 Unfortunately many beach huts were either damaged or destroyed at Milford-on-Sea in 2014. Surprisingly the concrete ones proved to vulnerable, in addition to timber huts. The concrete huts have been places at a relatively low level and there significant quantity of protective beach in front of them, except at low tide. Ideally they should have been higher and further back from the sea wall. That would not have stopped all flooding, but it might have avoided the smashing up by waves. I do not know why they are so low, but probably this corresponded to some former level of the former shingle beach here. 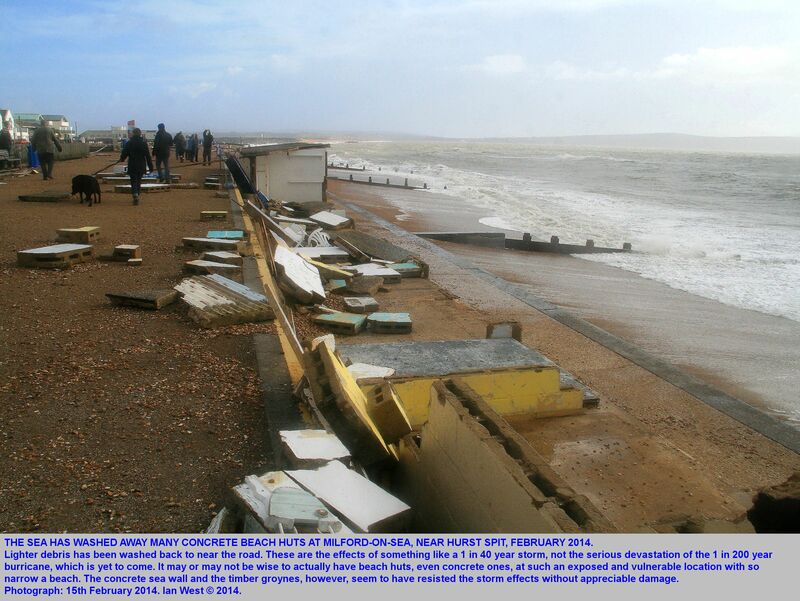 During fairly severe storm conditions in 2014 (about the 1 in 60 year intensity, not an extreme storm), many of the concrete beach huts of Milford-on-Sea were smashed by the waves. New ones have been build and completed in 2017. 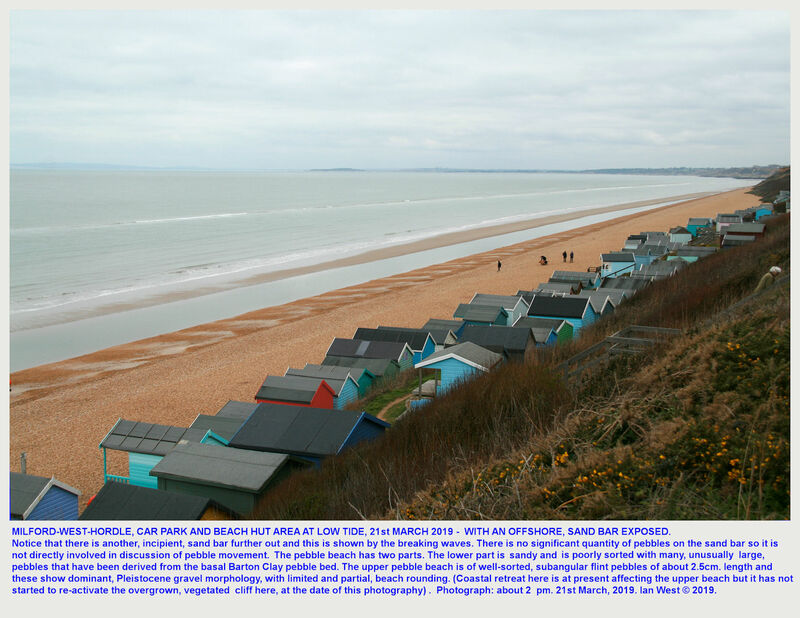 It is of course, optimistic to hope for very long term survical of new beach huts at a place like this, a type of promontory directly facing waves that can come from across the Atlantic. 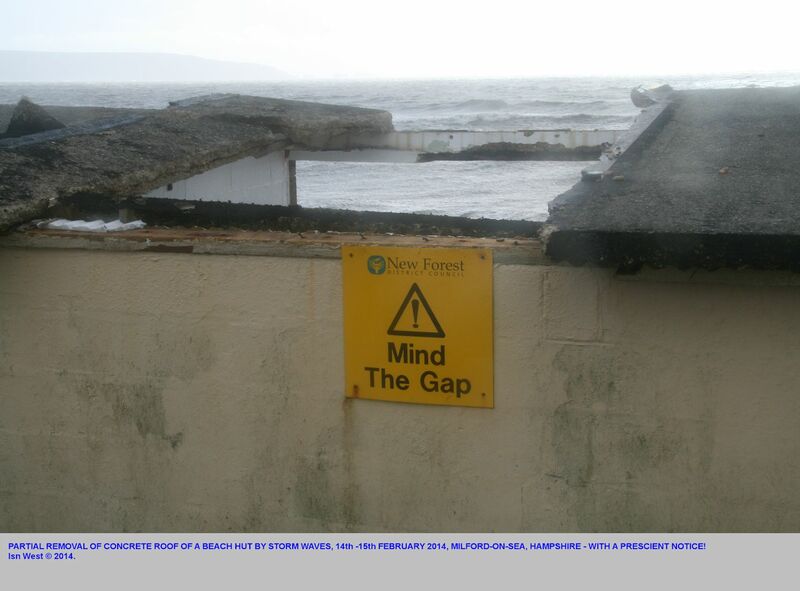 This is a very exposed place, unlike the more sheltered Bournemouth. 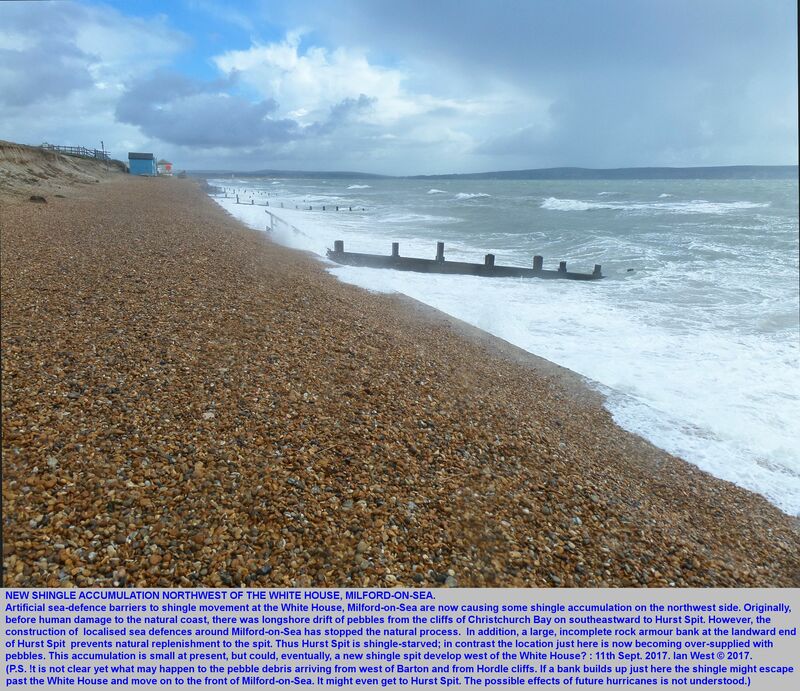 There is some protection by a small amount of shingle and by some small groynes, but it is very limited. However, really big storms, and especially the major hurricanes, only take place at fairly distant intervals and, in any case, these huts may well be stronger than the old ones. They are not conspicuous or ugly and the casual visitor, walking from the car park may not, at first, even realise that they are there (seen from the car park behind, they just looks like a sea wall). 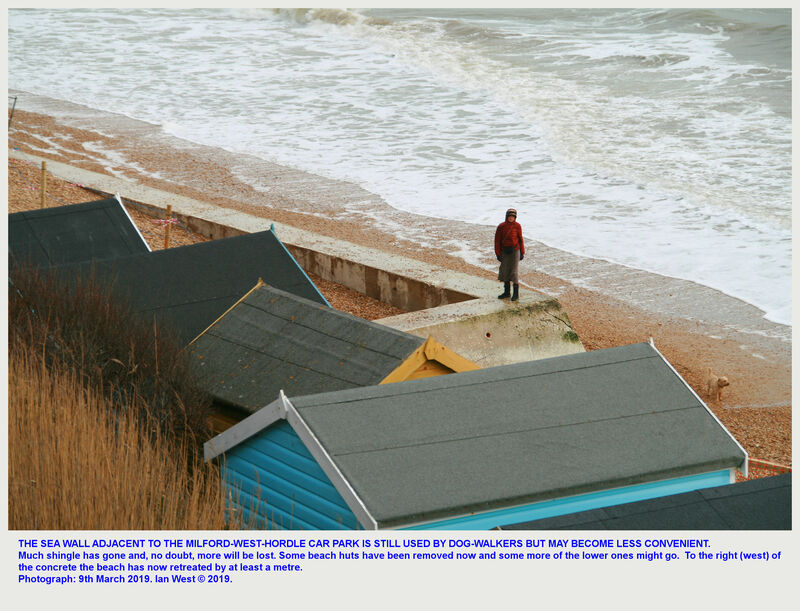 About 600 beach huts have been damaged or destroyed on the nearby south coast of England during the St. Valentine's Day storm. 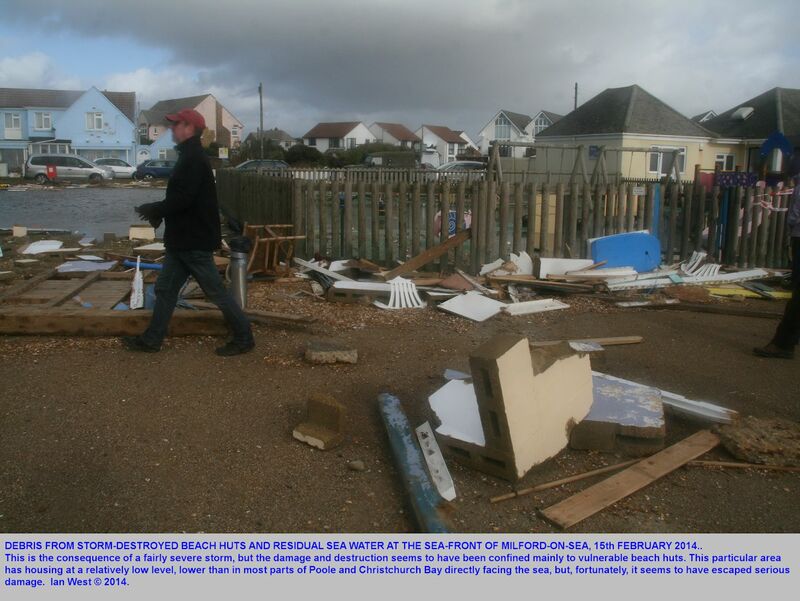 The stretch of coastline managed by New Forest District Council, which includes Milford on Sea and Barton on Sea, has had 40 huts destroyed and 100 damaged. (from report on BBC News online, 19th February, 2014). 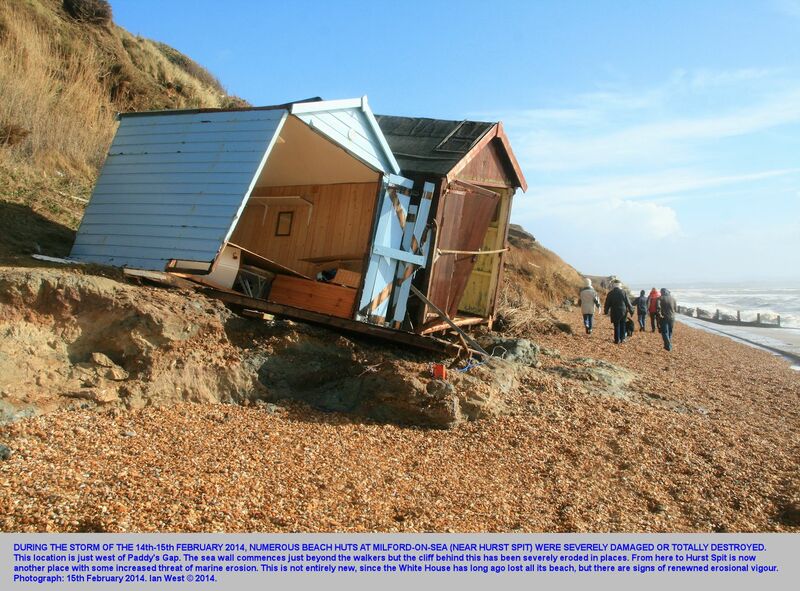 Of course, beach huts are normally placed near the sea and often at the foot of cliffs. With the possibility of global warming and more storms they inevitably carry increased risk of destruction. Records might be useful indicators of storm intensities, if statistics are retained. 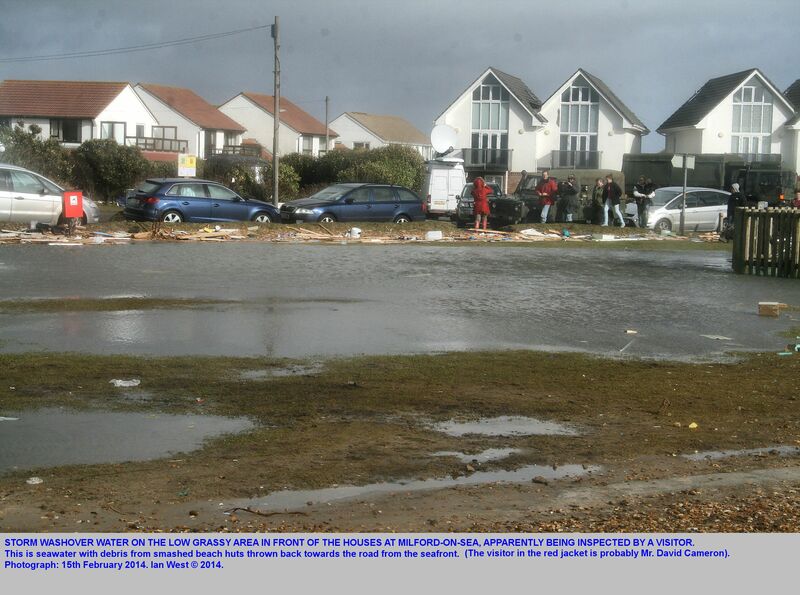 HURST SPIT - SITUATION - NOVEMBER 2013, AFTER ST. JUDE'S STORM. 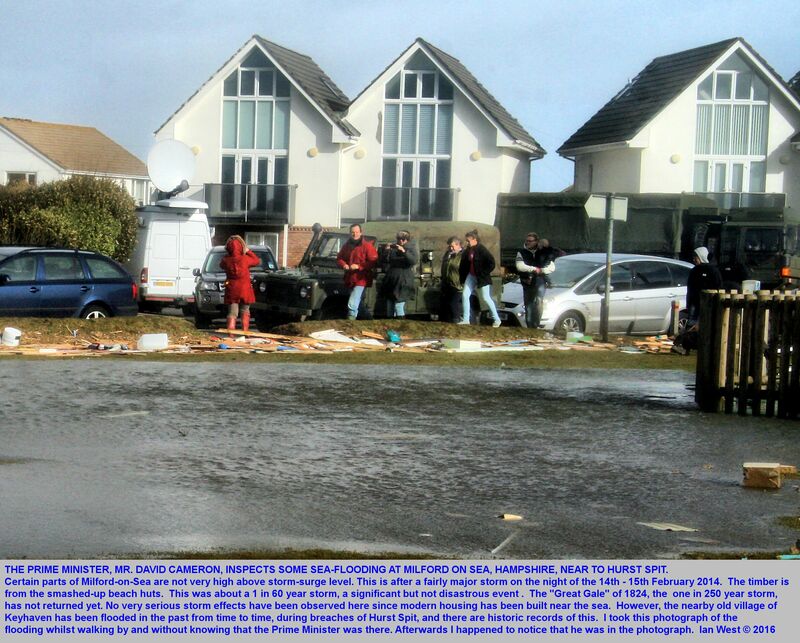 A minor storm, St. Jude's Storm, struck the bank on the night of the 27th -28th October 2013. This gave the beach a mild test. Wind speed at the Needles reached 95 mph but it was not a true hurricane like the "Great Gale" with a great storm surge (about 3 metres in Dorset), as on the 22-23rd November 1824. 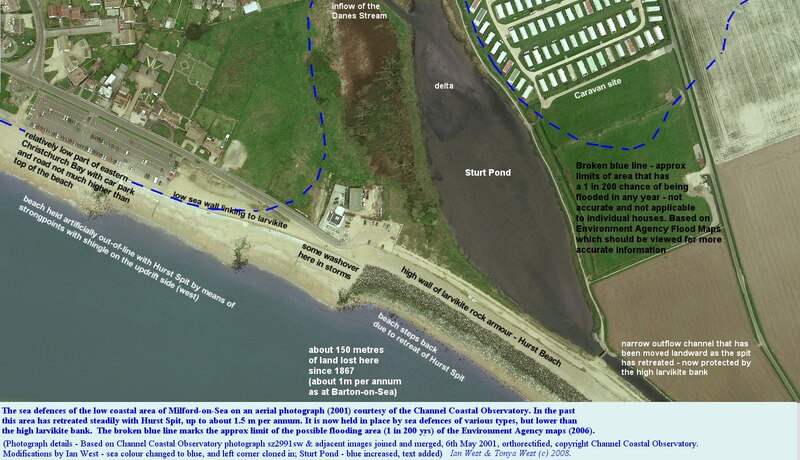 The 1824 event drove Hurst Spit at Milford back 40 metres in a day. There will probably be adequate warning and evacuation when the real hurricane comes, but the the effects will be numerically less than at the low parts of Weymouth and Sandbanks (and possibly Portsmouth). The hurricane of 1703 seems to have been of similar strength but more over the land. 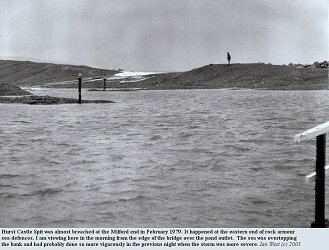 Photographs here show the consequences of St. Jude's Storm, although they are relatively small with some erosion and some limited washover of the bank. 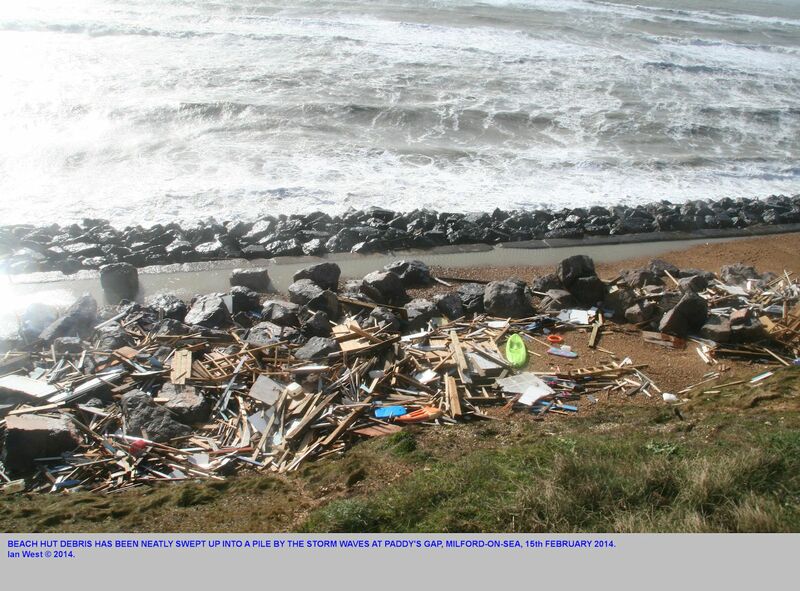 Further damage occurred after another storm, notable for very large storm waves, took place on the night of the 6th to the 7th January 2014. A photograph taken after this is shown further below. 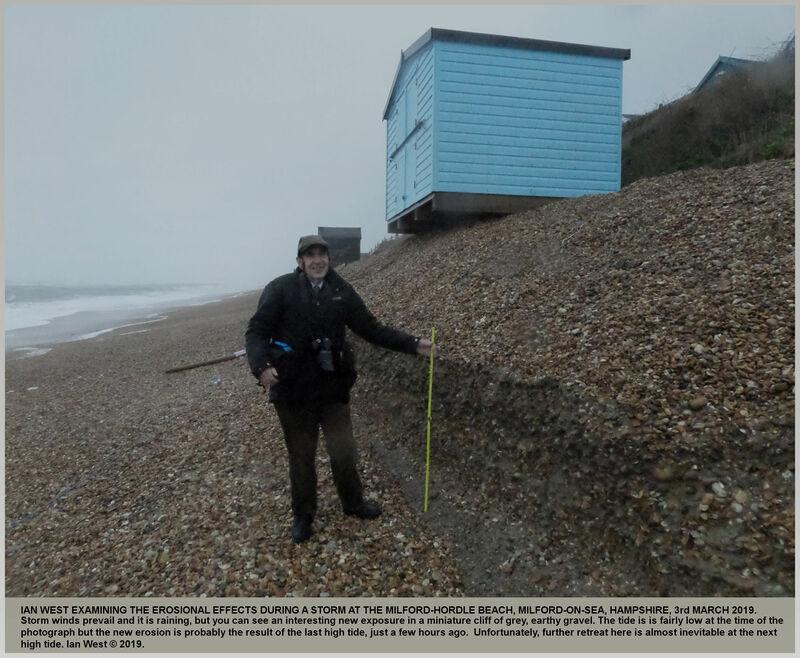 For comparison a photograph of the location shown above, but much later, on the 28th January 2016, is provided directly below. There had by that date been some loss of shingle here. The Lymington Times, January 12th, 2018. 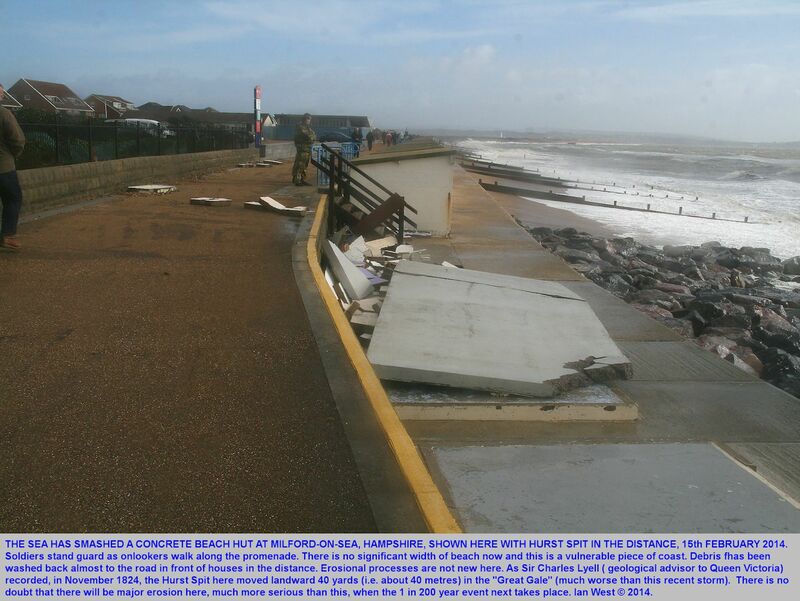 New Beach withstand a storm force battering. 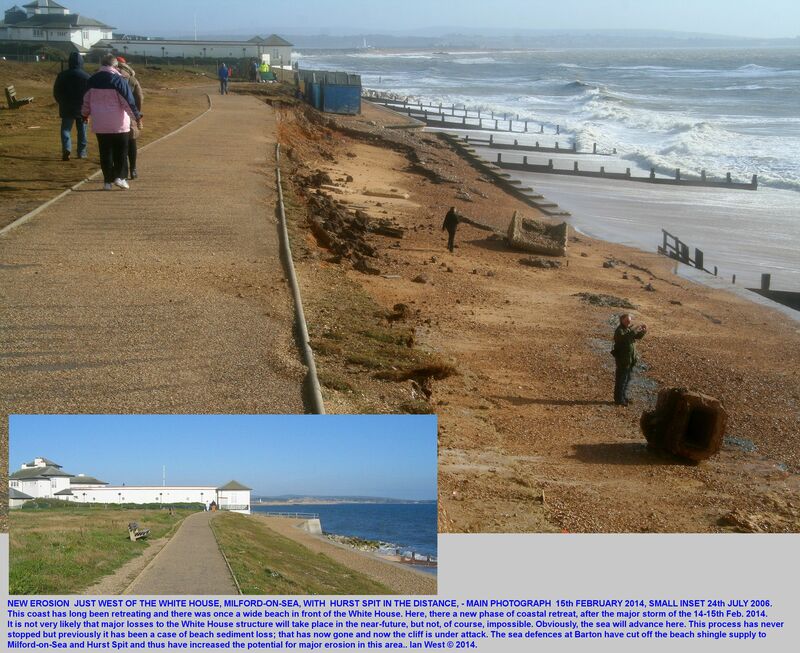 Hundreds of tons of shingle thrown on to rebuilt prom. By Roz Waters. 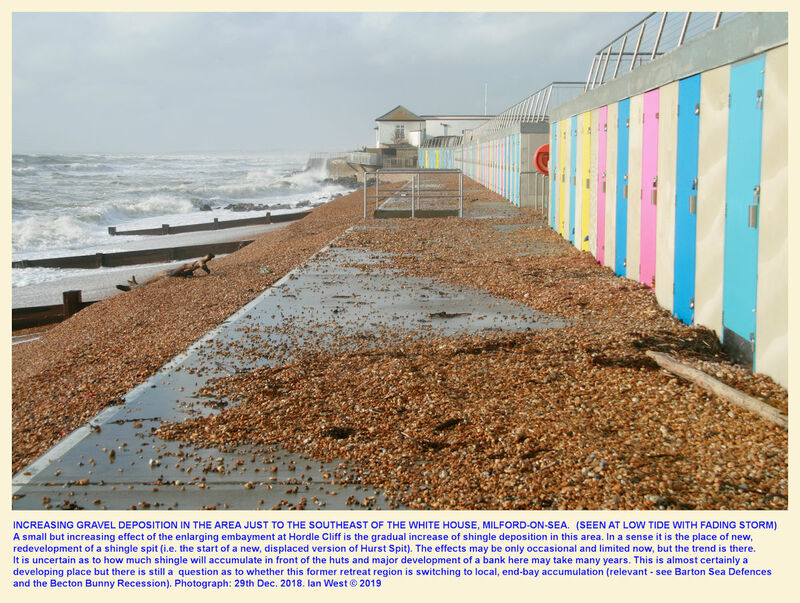 "A 2.3 million [pounds sterling] improvement scheme incorporating 119 new beach huts has withstood a major test after hundreds of tons of shingle were hurled onto a promenade during recent storms. 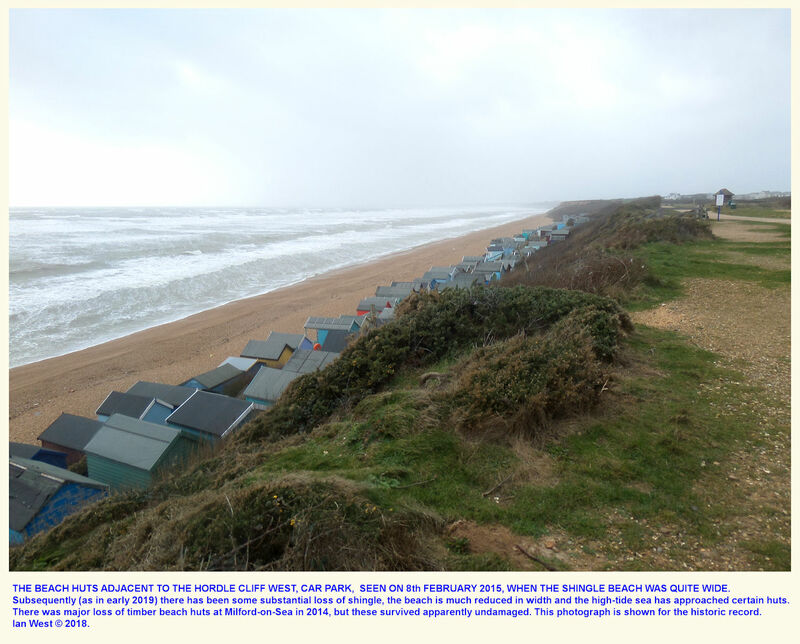 The beach huts which were officially opened in May 2017 were inspected by New Forest District Council's coastal engineering team last week, following storm force winds and waves in late December and early January. 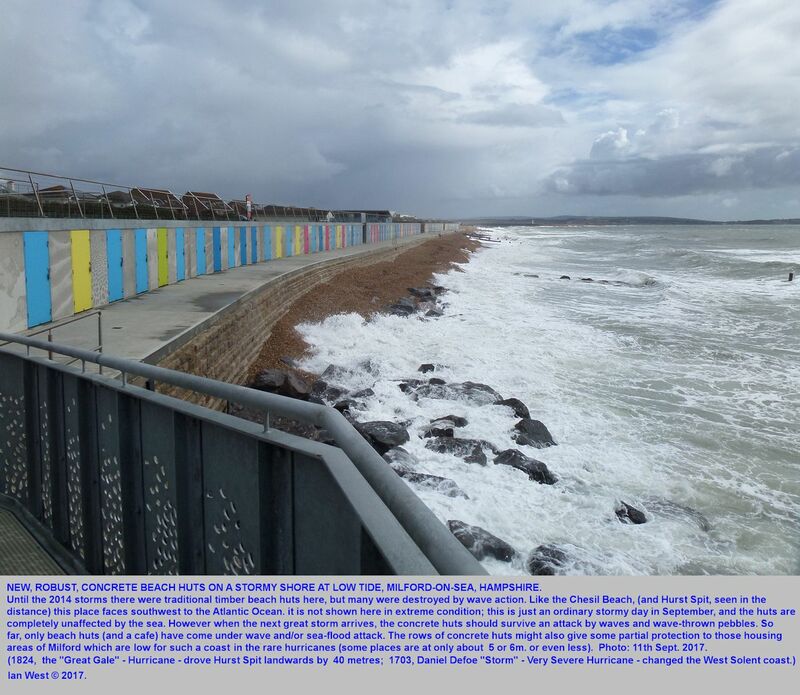 A combination of spring tides and several days of unsettled weather were blamed for dislodging a number of paving slabs from the sea front promenade close to the Needles Eye Cafe on Hurst Road. 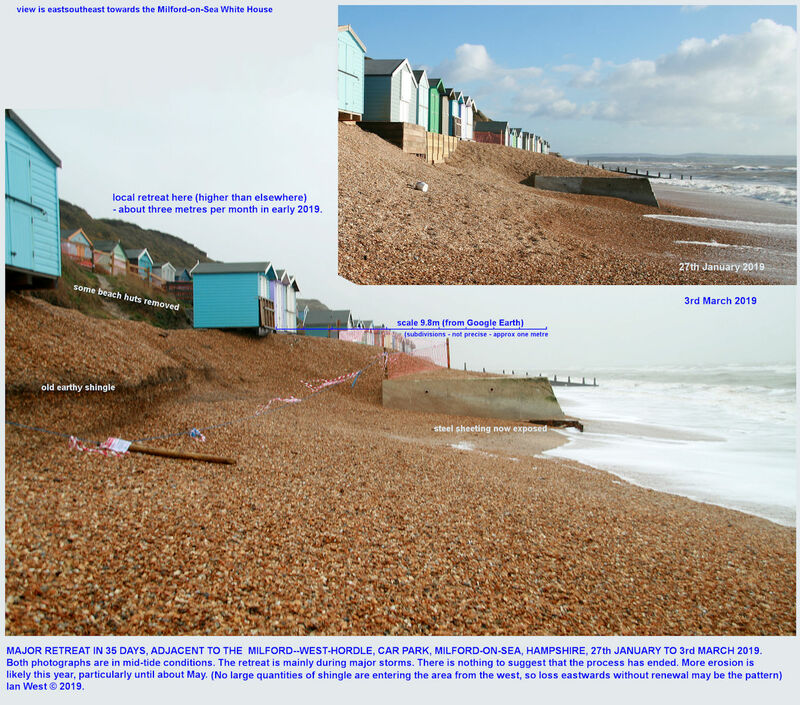 The coastal team estimated that between 400 and 500 tonnes of shingle was swept onto the lower promenade in front of the new beach huts, and waves overtopping the coastal defences also deposited shingle in the sea front car parks. A specialist recording buoy close to the coast at Milford showed wave heights averaging 3m. in conditions which are expected to occur about four times a year. However a spokesman for New Forest District Council explained that the height of the storm occurred over a period of spring tides, combining with a storm surge of 0.6m. leading to larger than normal waves. ....." continues. Christchurch Bay feeder to Hurst Spit, some preliminary comments. Christchurch Bay was once a continuous bay with a fairly uniform curve, and ending to the southeast at Hurst Spit to which the beach pebbles travelled (driven generally eastwards by southwesterly waves). 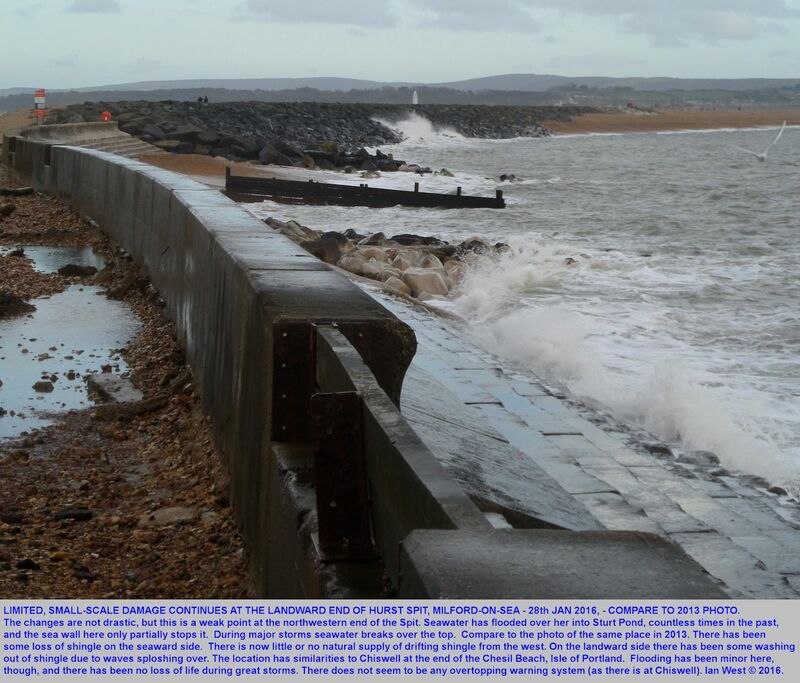 The bay has now been made very complex because of partial sea defences in certain places. 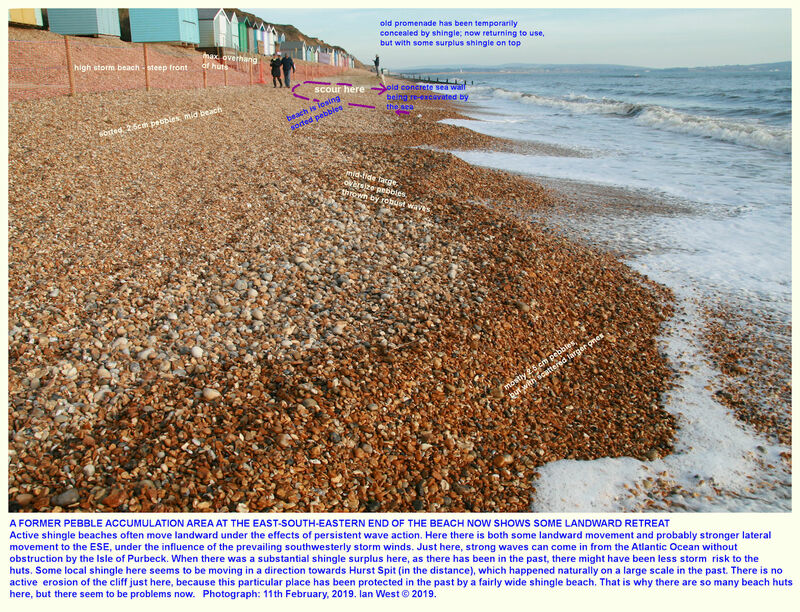 In particular beach shingle cannot pass the Barton sea defences, but there is rapid erosion near Becton Bunny (east of Barton) because of Terminal Groyne Syndrome (i.e. 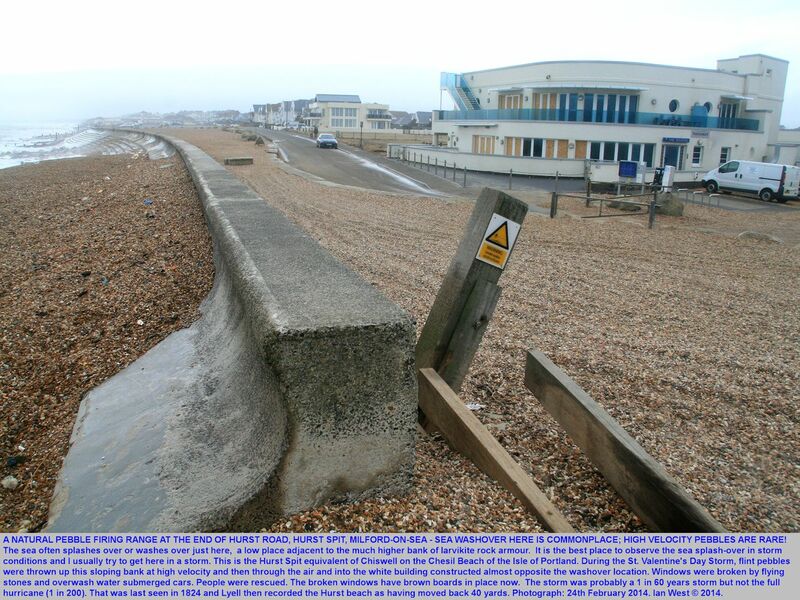 the effect at the downdrift end of groynes or other sea defences). The renewned erosion is supplying shingle towards Hurst Spit. There has been coastal retreat in the past at the low, coastal and to some extent vulnerable part of Milford-on-Sea. The matter is not simple and the future, of course, is difficult to predict. 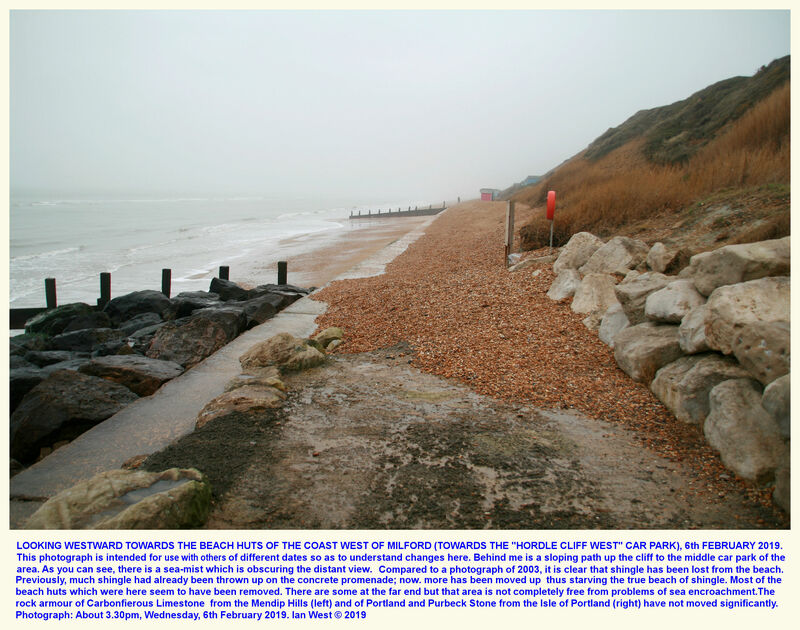 Now, in contrast to the retreat in area there are now signs of accumulation of shingle, derived from Becton and Hordle Cliff areas at Milford-on-Sea. 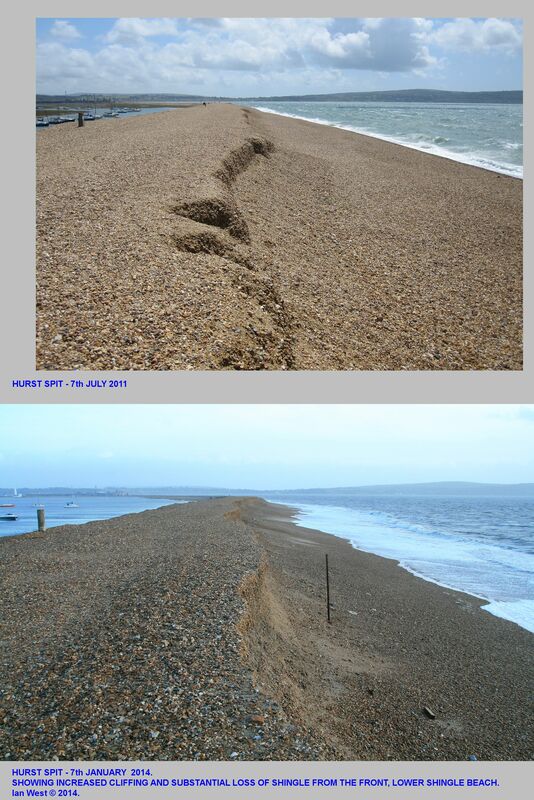 It is not clear whether the shingle can travel on to Hurst Spit or not. There is a limited stretch of obstructive rock armour at the landward edge of the beach. 1. 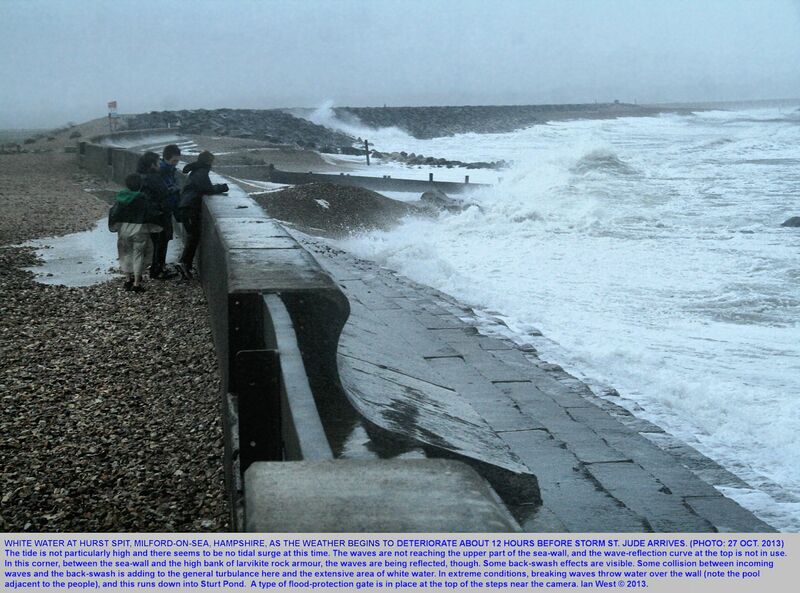 Will shingle continue to accumulate at Milford-on-Sea? 2. Will it be able to travel on to Hurst Spit? 4. Is this just some temporary phase and will the coast at Milford return to its natural erosional condition? It would obviously be very unwise to make predictions, except that the natural enlargement of Christchurch Bay is almost certain to continue, but probably in an irregular manner. Natural retreat of this new bay is the normal process and Hurst Spit has been the natural product (until sea defences, including partial rock armour complicated the whole matter). Now, however, a single eroding Christchurch Bay has become (at least) two eroding bays. It must be noted that the heights of certain parts of Milford-on-Sea may not be very far above the flood level of some of the great storms (like the 1703 great hurricane, the 1824 "Great Gale" etc.). There is no certainty as to what is happening and, of course, great storms cannot be predicted very long in advance. 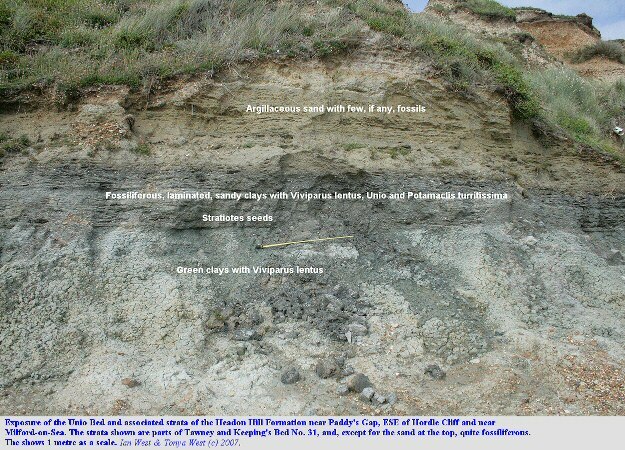 Erosional and depositional complications might be developing in the area. The changes seen from 2014 to 2016 are mainly just degradation, with the footpath moved back inland a short distance. All looks fairly normal again - until the next really big storm here. The cliff may move inland only rarely, during a great storm, but it has attacked and there has definately been a small coastal retreat. There will be another, of course. It is now expected, whereas it may not have been previously. The sea is naturally advancing here in spite of obstacles placed by humans, and Christchurch Bay will continue its natural growth and development. The problem is not one of steady rate but of the frequency of occurrence of rare, great storms. It may take off a chunk of cliff in the night and then be peaceful and do nothing for years. Christchurch Bay is a very shallow bay, at least the landward part. It is mostly less than 10m. deep. The cliffs of the bay are largely twice to three times this. This shallow stretch of water is the youngest bay around in the region (Velegrakis et al., 1999) and very rapidly inundated. It was initiated by fast flooding and erosion at the astonishingly recent date of only 7,500 years BP (before the present). By comparison the Pyramids in Egypt were built at about 4576 years BP. This modern and rapid sea encroachment should move on inland into the New Forest area in a short while (geologically speaking). In this perspective, it is not surprising that Christchurch Bay enlarges rapidly, although probably not quite as fast as the similar Brighstone Bay on the Isle of Wight. Both are open to southwesterly storm waves from the Atlantic, and both show coasts with obvious erosion (which is why they are good for fossils). 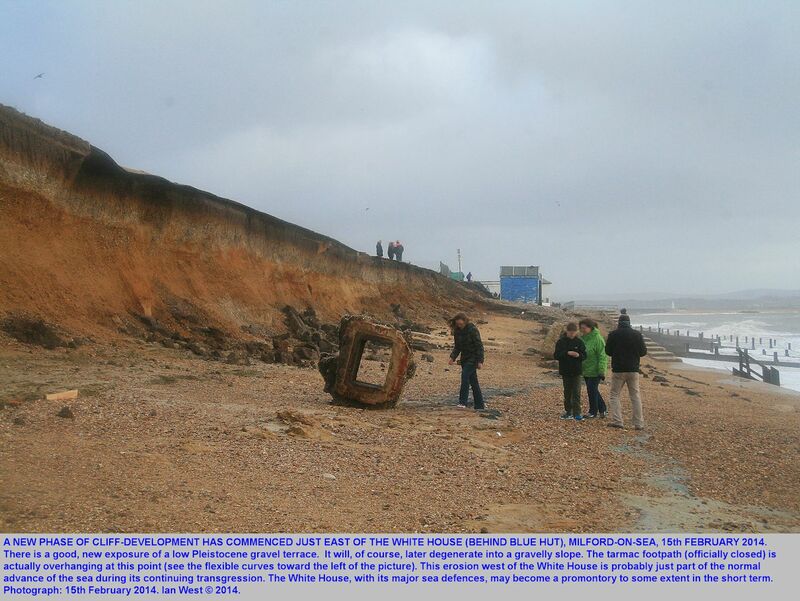 West of the White House, there is evidence of continued erosion above the concrete and rock armour sea defences. Sea level is slowly rising and storms are becoming stronger. They are probably just beginning their process of attacking above sea defences in the region. This may be just an individual case and it is partly just normal retreat. However, it is influenced by the unusual, coastal orientiation problems, caused by the Barton rock armour sea defences (that have shut off some beach sediment supply) and also by changes in the beach at Hordle Cliff. As is well-known, Christchurch Bay has no overall and consistent sea defence scheme. Local sections put up their own barriers (holding back sediment) without concern for anyone down drift. 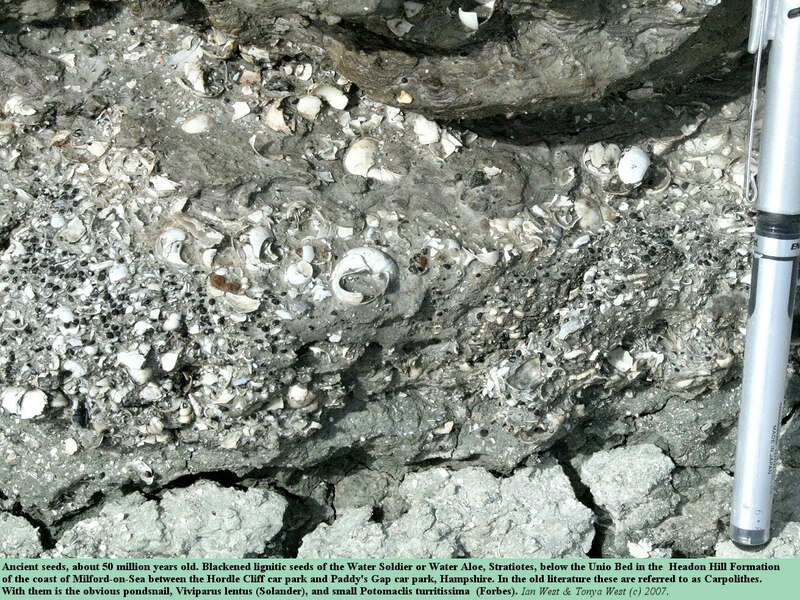 The most obvious case is Barton-on-Sea, once a major source supplier of pebbles (and reworked fossils) to Hurst Spit. 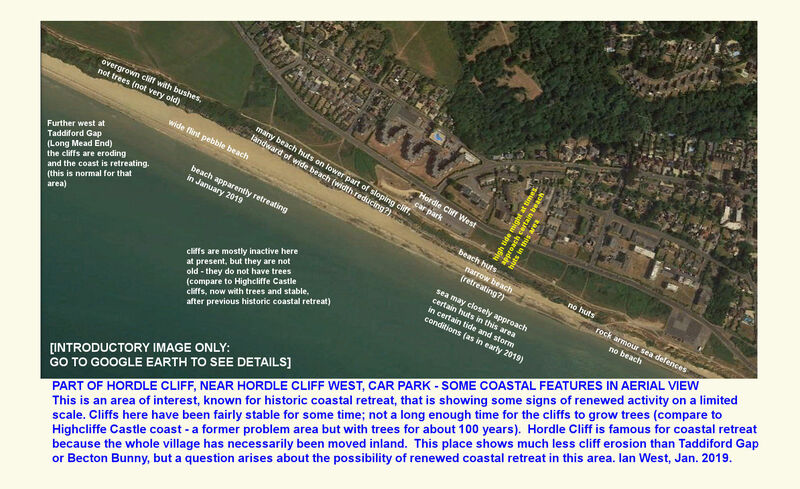 The concern there is to preserve houses on the cliff top, without looking too far down drift. It is too late now to repair Christchurch Bay to natural equilibrium without enormous cost and increased risk to houses. Incidently, watch for the possible development of a new Hurst Spit, east of Milford-on-Sea. 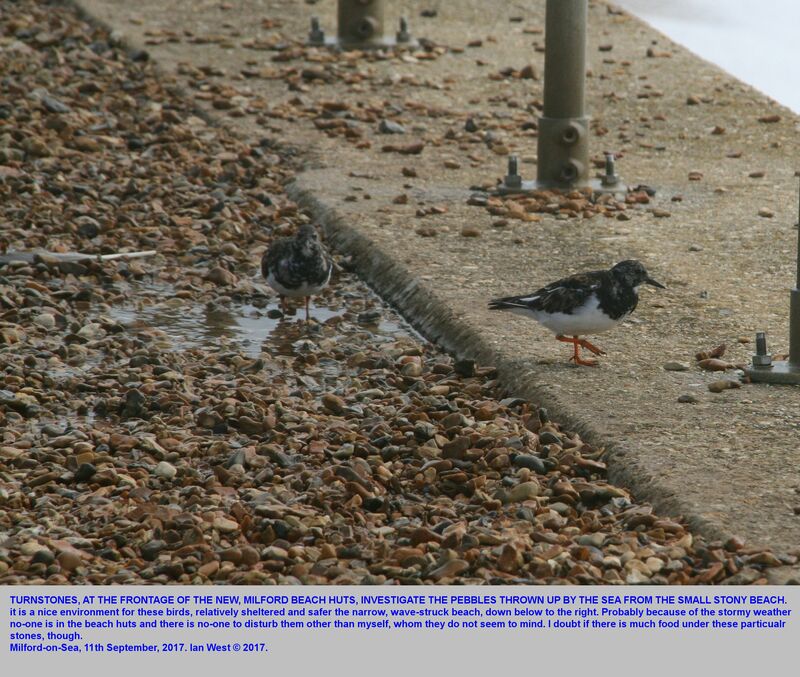 Pebbles are largely stopped by concrete east of Milford, and as Becton Bay develops further, as a result of Barton-on-Sea defences, then further re-alignment and new Hurst Spit development is a possibility. The short stretch of coast from Paddy's Gap to the White House is very interesting. It is the part of Christchurch Bay which is most depleted in terms of beach material. This was not the case in the past, and thus its cause is an interesting problem. The relatively low cliff is protected by a sea wall with gravel at the back and, now, rock armour (largely Carboniferous Limestone) in front. 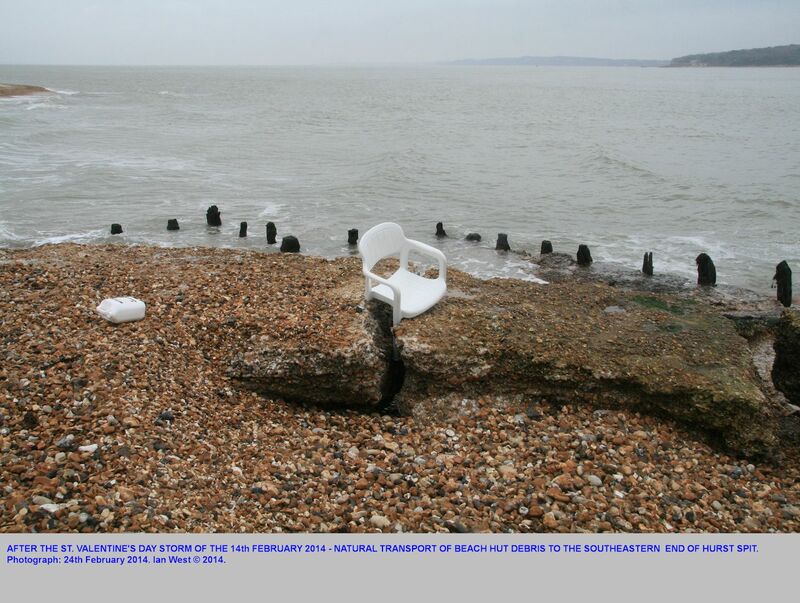 Presumably this has been required because of the risk of rapid coastal reatreat which might take place. 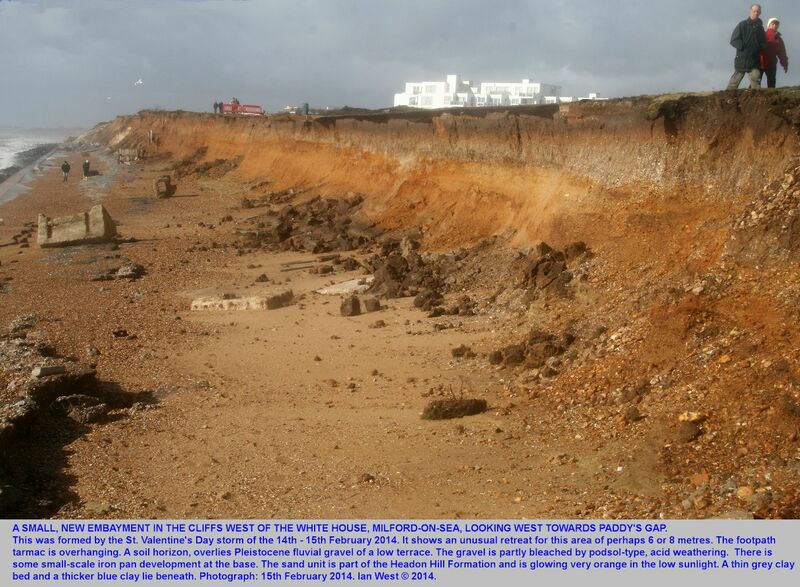 Apart from the White House, there is no housing immediately on the cliff top, but it is not far back from the cliffs. Thus, this is an interesting place to observe problems of the horizontal proximity of the sea to the location of the cliff top. There is a very narrow cliff and no beach at high tide. The sea wall is not very high but is regularly maintained. Gaps could be filled with rock armour and gravel, should they appear. However, the longer term prospects are interesting to consider. Rising sea level and more storms are very likely to cause problems here over the next 100 years. Quite apart from a probable rise in sea-level or 60 cm or a metre over a hundred years, major storm events may take place. In any case, the great 1824-type hurricane has not yet returned. 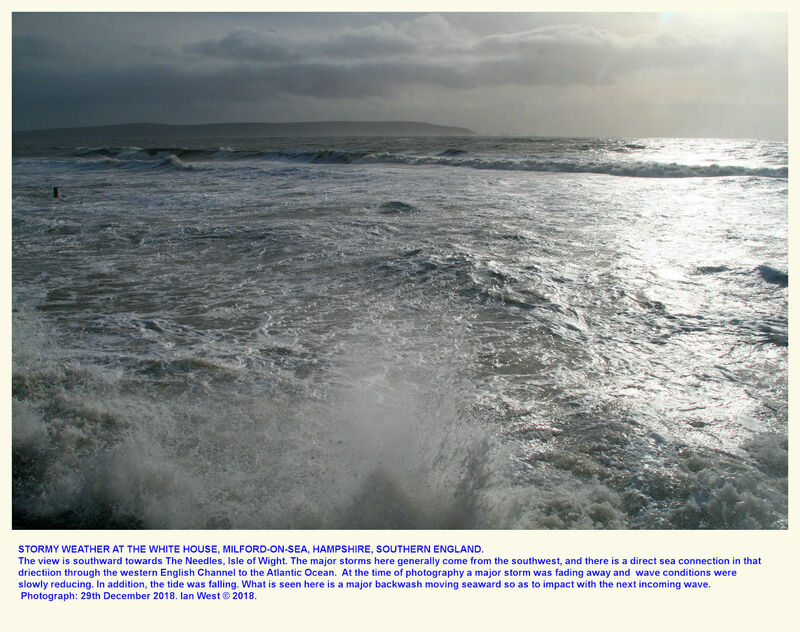 When this one-in-250 year event happens again, as, of course, it will then the sea attack here could be very serious, much more so than shown in the photographs below. 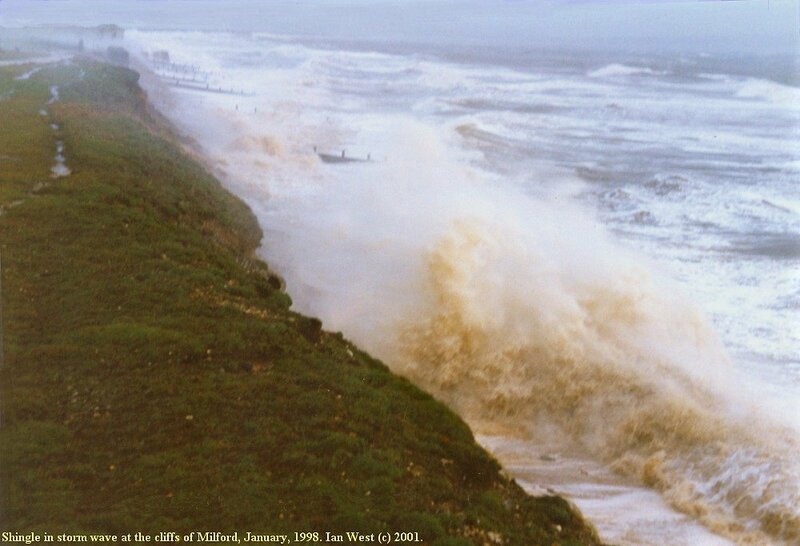 This storm in the morning of a day in January, 1998 hit the Hordle coastline quite severely (anyone interested could probably find meteorological records regarding the storm). 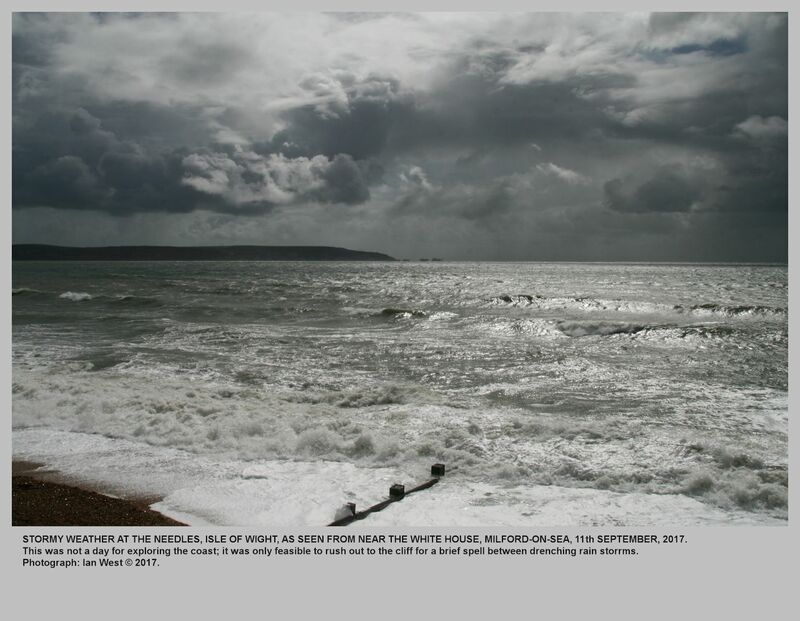 The photographs shown here were taken at Rook Cliff, Milford on Sea, east of the main Hordle Cliff geological section. ,where there are some sea-defences. The location of photography was from the eastern side of a car-park (map reference SZ 282917) on the greensward at the western end of Milford. In the distance is the old sea-front hospital, with a characteristic horseshoe-shaped plan. 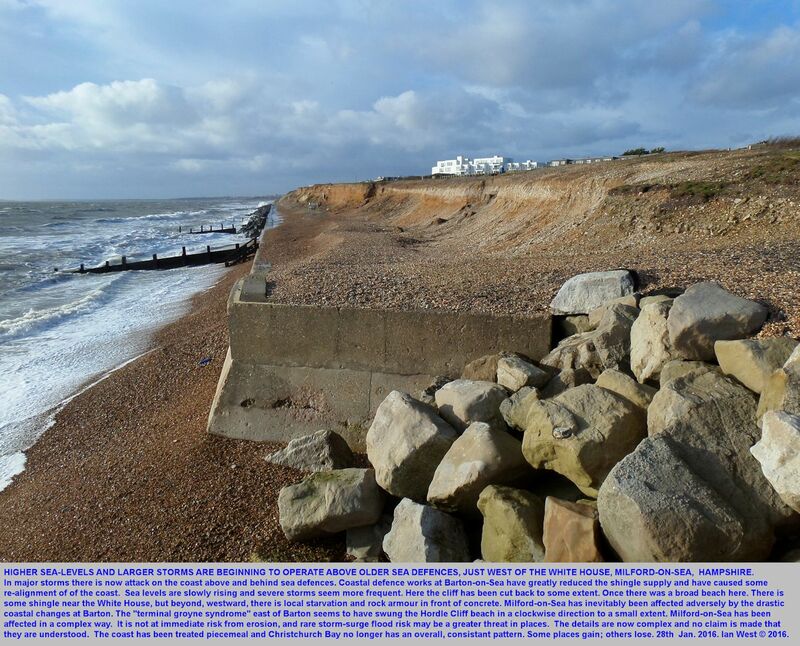 There is a promenade and sea-wall at the foot of the cliff here and groynes commence at this location and are placed at intervals between here and the building in the distance, as can be seen in the photographs. They seem to be little consequence in these conditions. The storm waves are oblique to the coast and are coming from a southwesterly direction, that of maximum fetch. These can come up the English Channel, just missing the Brittany Peninsula, to the south, and just missing the Isle of Purbeck peninsula, not far away. 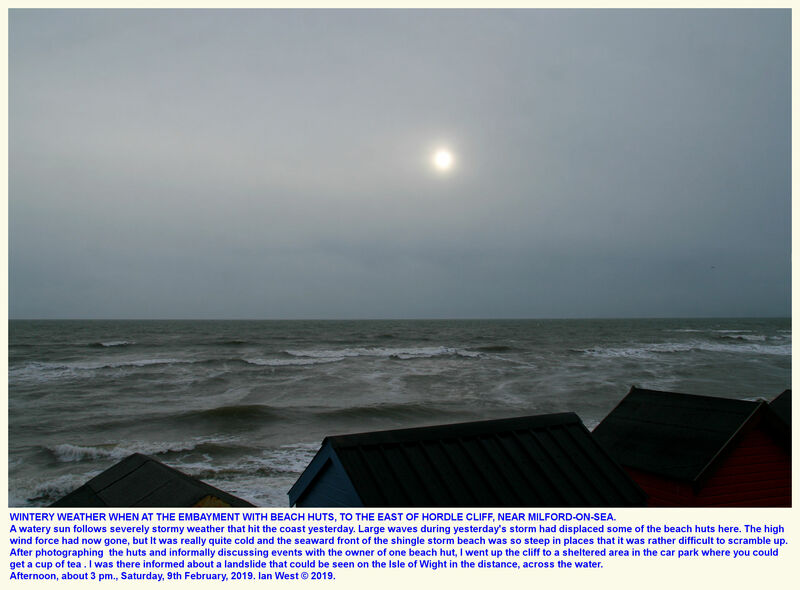 The southwesterly direction is that of the prevailing wind and storms from this direction are common occurrences when Atlantic depressions and fronts hit the region in the winter. 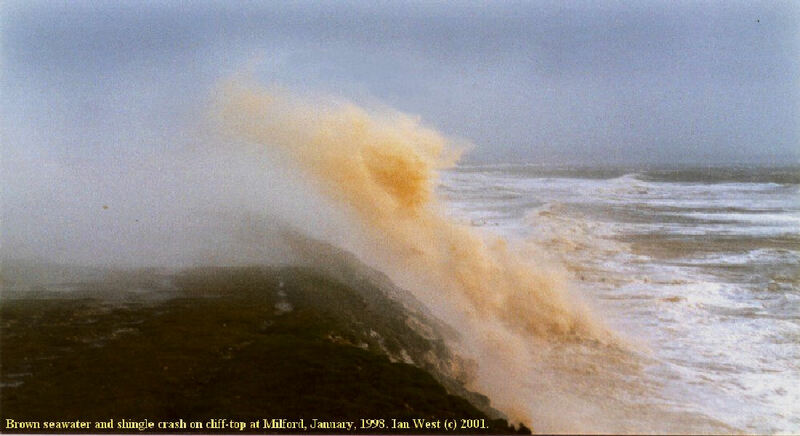 Thus big waves, perhaps originating from the Atlantic, can occasionally attack the coast from Barton-on-Sea eastward to Hordle Cliff, Milford-on-Sea and Hurst Castle Spit (and the western Isle of Wight). 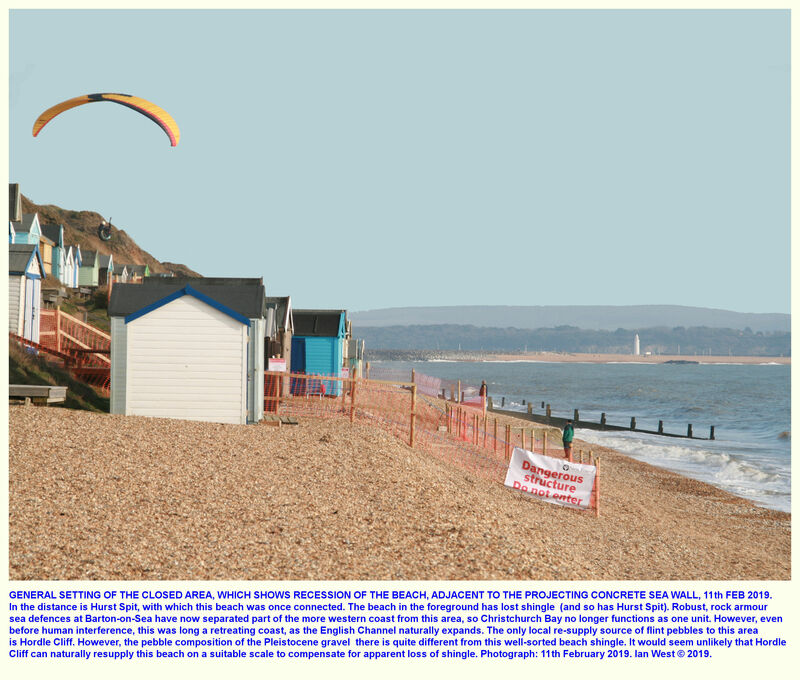 Highcliffe, further west is, of course, not completely safe from major wave attack but is protected to some extent not only by the Isle of Purbeck, but also by the promontory of Hengistbury Head. Relatively shallow water can reduce the wave effect to some extent. Nevertheless this is an interesting stretch of coast in geomorphological terms, because it has the combination of cliffs of poorly consolidated clay, sand and gravel and the occasional subjection to major storm waves from the southwest. We can now consider the details of the particular storm event. The waves were impacting on the sea-wall of the promenade and throwing water and spray high so that it could reach to top of the cliffs, only at about 10m here. Sea-water then ran back seaward down the cliffs eroding Pleistocene gravel and carrying down to the promenade and the sea. This brown gravel is the cause of discolouration of the sea-water. The gravel was churned up in the waves and then thrown back again up the cliff. Gravel thus landed on the cliff top and in one of the photographs an individual pebble in movement in the air can be seen. The showering of gravel on the cliff-top made the author aware that he had parked his car in an unsatisfactory place (quite apart from the sever wind-buffeting and the salt-water wash) and although impact damage to the windscreen was only minor the visit was necessarily curtailed. In the afternoon the wind-speed decreased to more normal conditions. Milford-on-Sea is at the eastern end of Christchurch Bay. The prevailing winds are from the southwest and thus the dominant long-shore drift is towards the east. In natural conditions, without the presence of major sea-defences hindering supply and movement, shingle from the Pleistocene gravels of Barton-on-Sea and Hordle Cliff is transported eastward along the beach to Milford-on-Sea and thence to Hurst Castle Spit (where, indeed, some Barton fossils are found). The normal consequence of this is a build-up of beach material at Milford and this has, in the past, probably retarded cliff retreat. The offshore bar, which would also have consisted of material drifted from the west, would also have provided some protection by moderating the effect of waves. The photograph above shows a small part of the beach in its natural condition in 1932. At this time the beach was wide and the berm rose to almost the level of the land surface at this location. The crest shows oblique ridges because of some alignment to a mild promontory at Rook Cliff and Hordle Cliff to the west of this. Thus in natural circumstances Milford is to some extent a location of accretion whereas Barton is primarily a location of erosion and supply of pebbles. Conditions have changed now but Milford-on-Sea has probably been subject to a low rate of coast erosion in the past because of the broad protective beach and the offshore bar. The natural sea-defences have largely been lost now but the concrete and blocks of Carboniferous Limestone, the main artificial substitutes, seem to be holding firmly, at least for the present. The landward beach limit or effective cliff-line has retreated a little beyond the trend of the wall, especially on the east side (the down-drift side) of the concrete defences shown. At Milford-on-Sea, the most impressive feature of the sea-front is the White House. This was built in 1902 by the Walker-Munro family, colliery millionaires of Rhinefield House in the New Forest. This summer sea-side residence became a children's hospital from 1938 to 1983, and in 1999 was restored by Colten Developments Ltd. It is a nice building of historic interest. 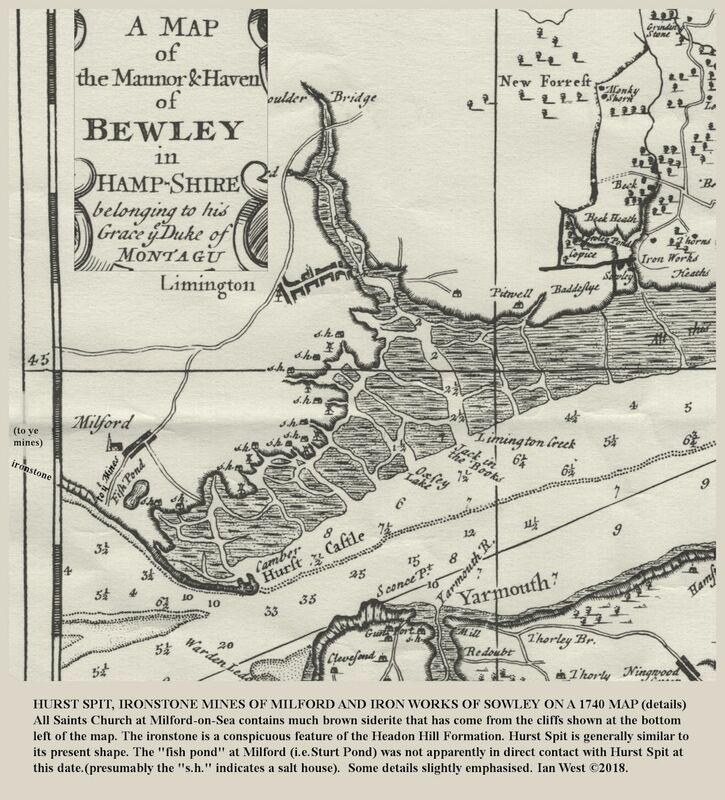 It is also of geomorphological significance as marker with regard to coastline recession and longshore drift of gravel, and is referred to again below (see 1938 ). 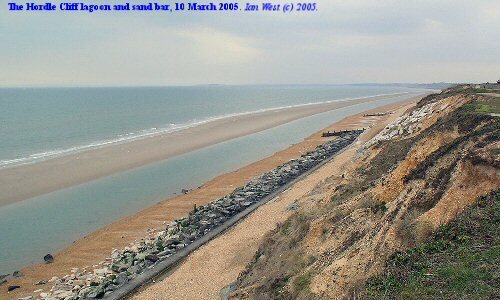 It originally had a broad beach in front of it, but it is now protected by a small promontory of sea defences. Coast retreat is clearly seen at the White House from the above photograph. One is from 1932 and the other one from 2003. 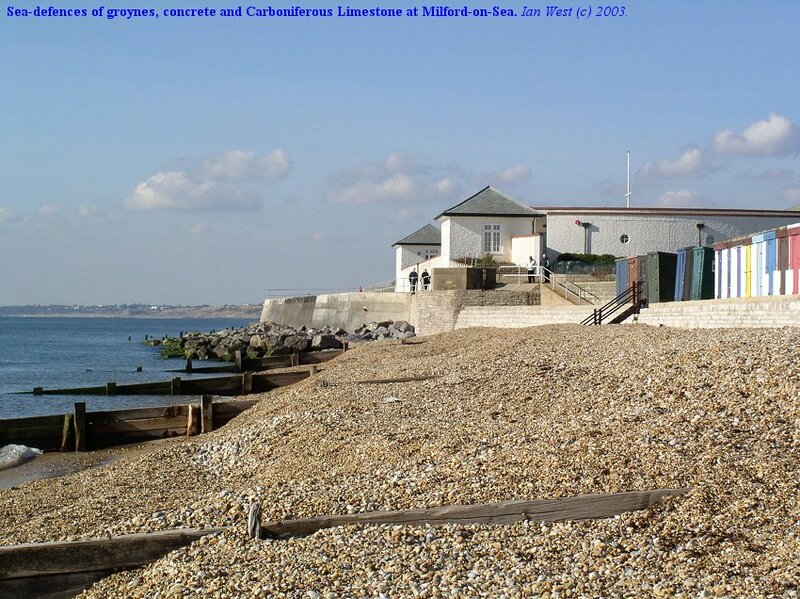 The seafront at Milford-on-Sea is important to Hurst Spit because it is the feeder area, through which in the past the shingle from the Barton and Hordle cliffs reached the spit. A aerial photograph of the White House, the conspicous white building to the west of the small town (and mentioned above), was taken in 1932. 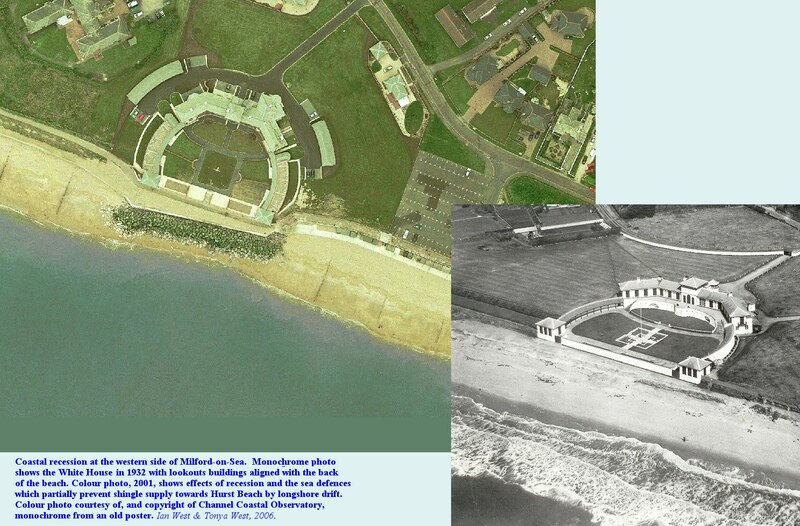 It shows the two lookout or viewpoint buildings aligned with the back of the beach. As mentioned above, it was built in 1902. Its exact relationship to the beach at that time is not known, but since coast erosion here has been progressive it is probable that the beach was even wider or further to south in 1902 than in 1932 . Notice, incidently, that in 1838 the narrow concrete wall, oblique to the coast, was already in existence already. Perhaps, there had already been some threat of coast erosion. I wonder why it is not parallel to the sea frontage of the building; perhaps it was intended to trap the southeast-moving gravel. 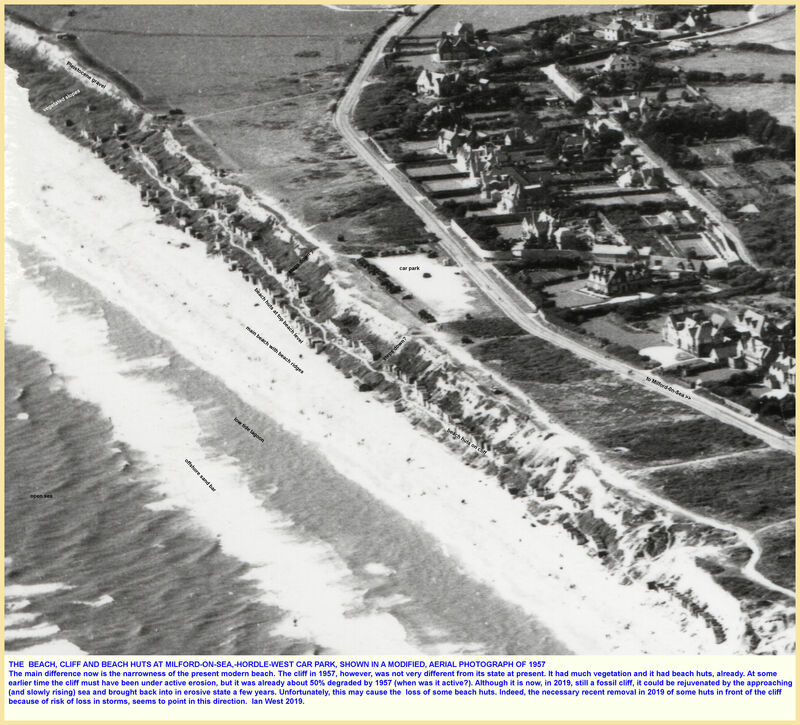 In 1938, unlike the present day, there was a wide beach that seems not to have been significantly damaged or destroyed by sea defences to the west. Shingle could then pass by long-shore drift from west to east (in accordance with prevailing southwesterly winds) and supply Hurst Spit. 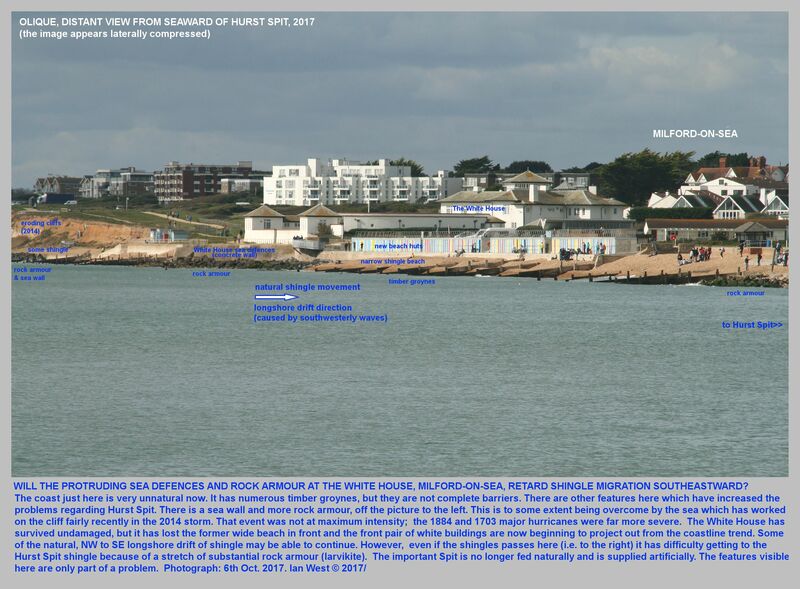 The photograph of the White House on the 6 May 2001 by the Channel Coastal Observatory, shows a very different situation. Much rock armour has been placed in front, and there is more of this further west. Now shingle cannot easily pass the various obstructions, of which this is only one. 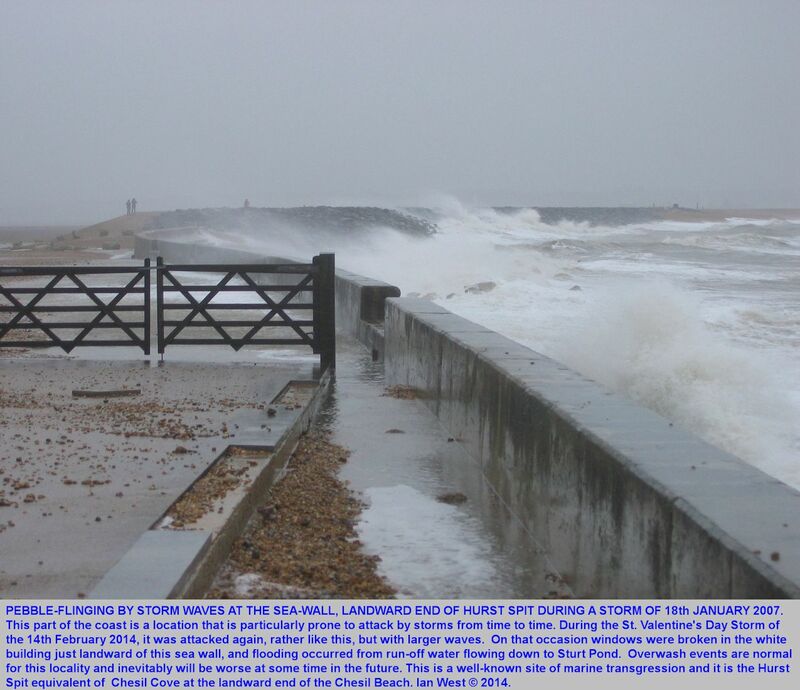 In any case it cannot proceed further southeast because of major sea defences at the Milford end of Hurst Spit. Newspaper report: Anonymous (1953). 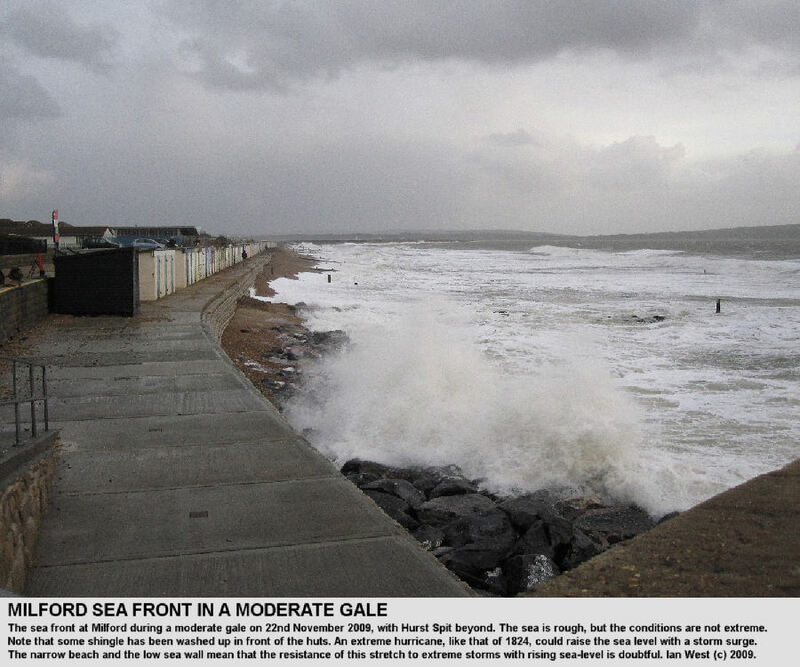 Sea encroaches 30-40 feet. New Milton Advertiser, 25 July 1953, p.1. Article not seen, but referred to by Delair (2007). 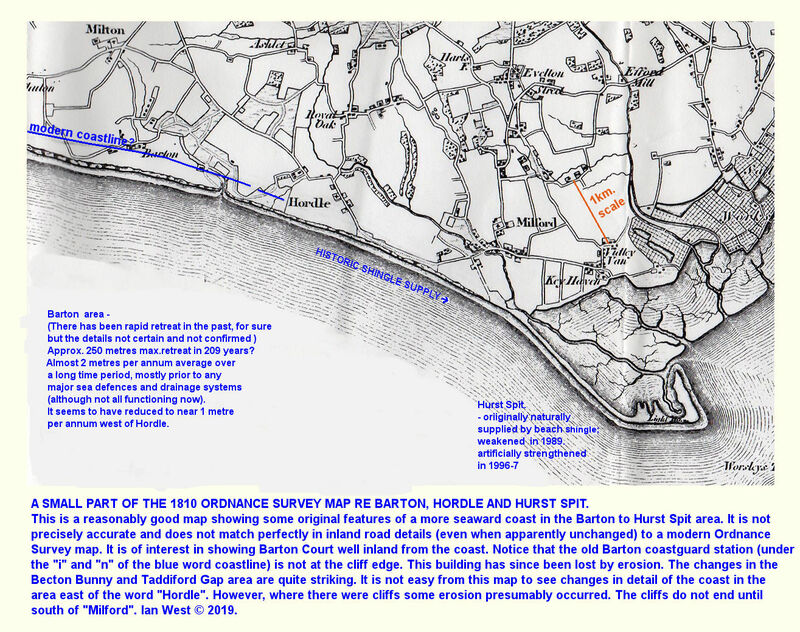 Hurst Castle Spit is discussed in detail in a separate but associated webpage - Hurst Spit. 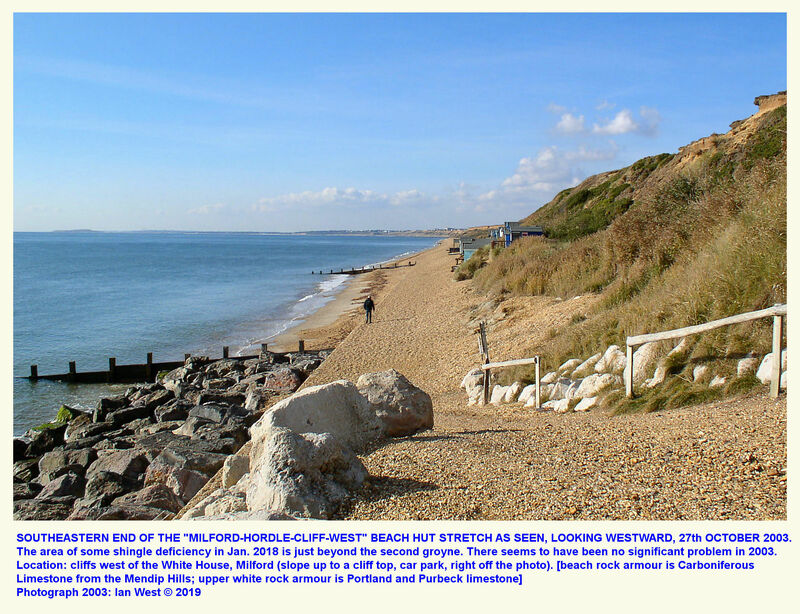 It is, however, relevant to mention it here in relation to movement of beach material from and past Hordle Cliff and in relation to Milford-on-Sea. The spit represents the destination of subangular flint gravel travelling by long-shore drift eastward from the supply cliffs of Highcliffe, Barton-on-Sea and Hordle Cliff. The supply from Highcliffe and Barton has been cut by sea-defences long ago but the beach at Hordle Cliff has remained quite wide, at least until recently. There has been much residual gravel and the increased erosion at Beacon Cliff must have helped. 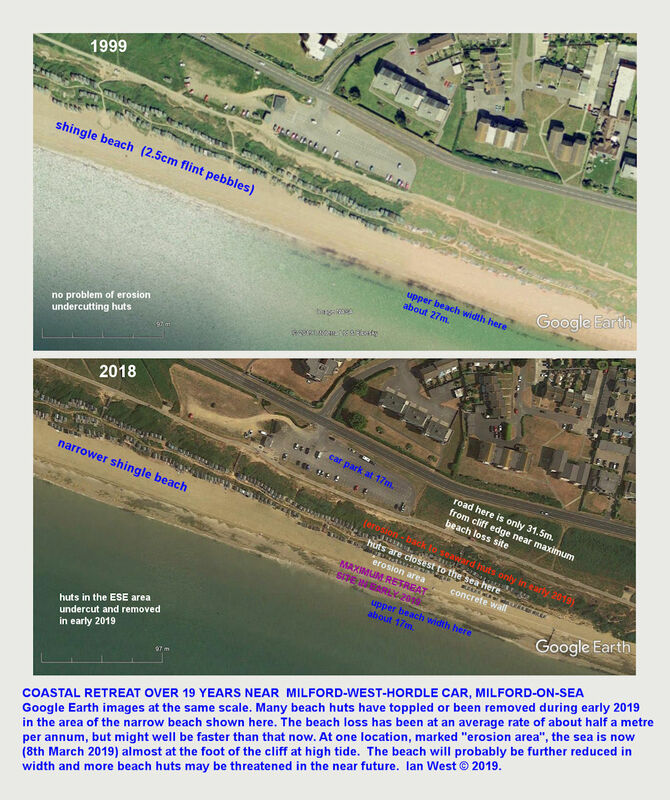 In addition there has been some realignment of the trend of the beach (probably a very small clockwise shift in the Hordle Cliff area) which has had its effect. 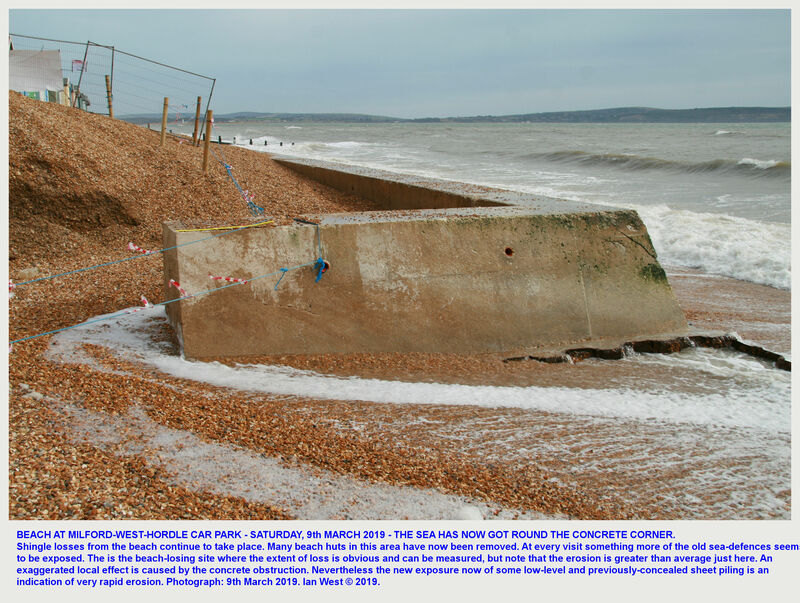 The natural overall retreat of the coast must have caused some concern at Milford-on-Sea back in the 1950s because at about that time some defences were constructed there (as indicated by old photographs). 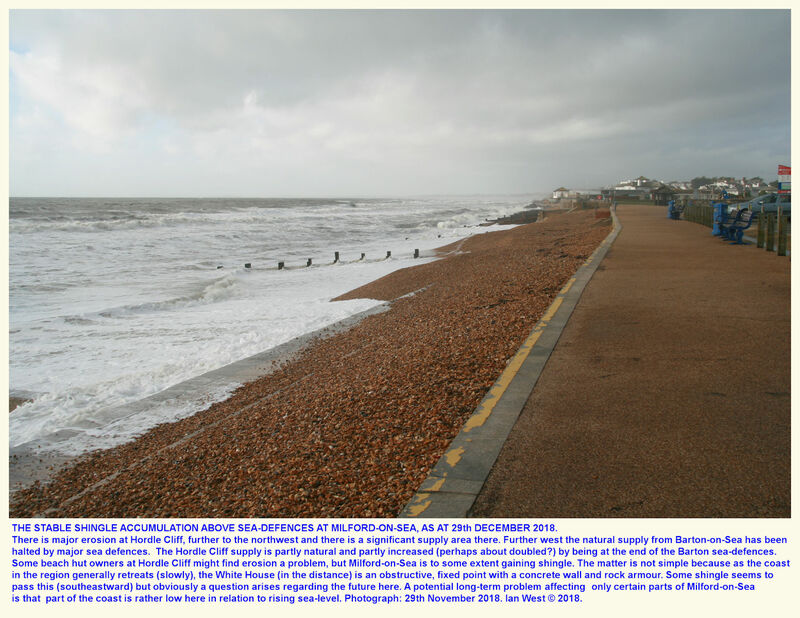 The sea-defences have been strengthened there (see the images above regarding Milford) and now it is very difficult for shingle to pass eastward of Milford beach. 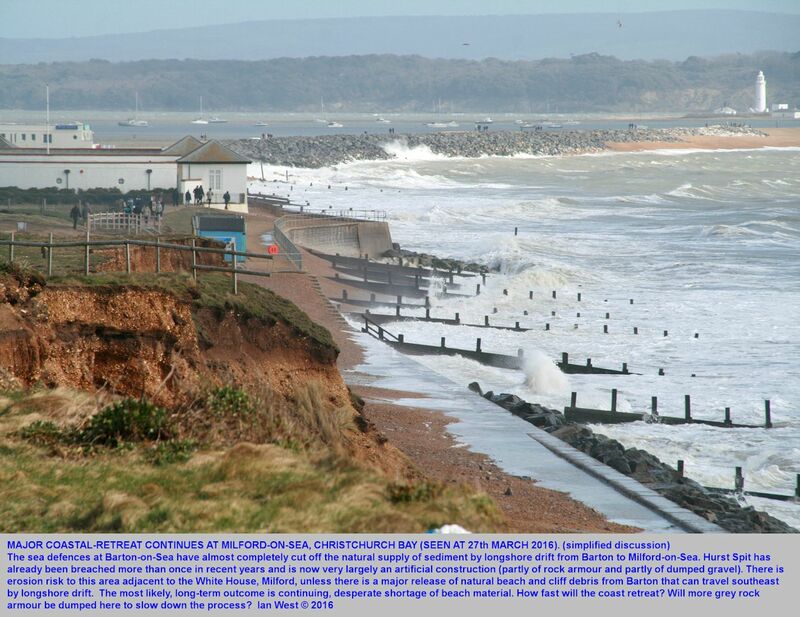 The Hordle Cliff, Barton and Highcliffe shingle is not able to reach the spit. At the landward end of this geomorphological feature some sea-defences in the form of rock armour were added. 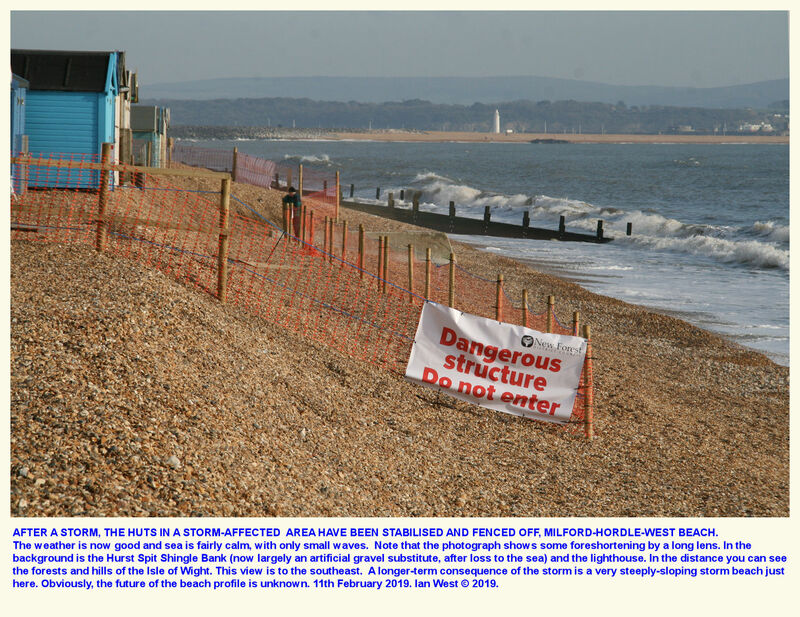 This seems to protected part of the beach but reduced shingle supply eastward. Thus, in February 1979, the sea almost breached the beach directly east of the sea-defences and the beach ridge was stepped back out of line. Later, after after a major flattening of the shingle spit by the sea, Hurst Spit was rebuilt from larvikite and dredged shingle. 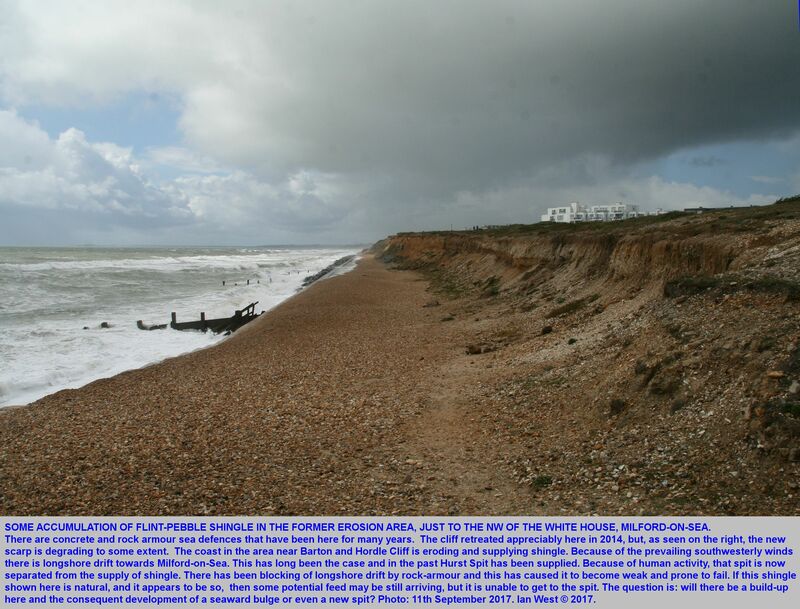 For more information on Hurst Spit and on its artificial reconstruction see: the Hurst Spit webpage. Shingle Movement at Milford, early 2018. Embayment with shingle and Beach Huts at the westermost, seafront car park of Milford-on-Sea just before the main road swings inland, and just before Hordle Cliff, which is immediately to the west. Above is a 1957 aerial photograph of the cliffs adjacent to the Milford-Hordle-West car park, i.e. 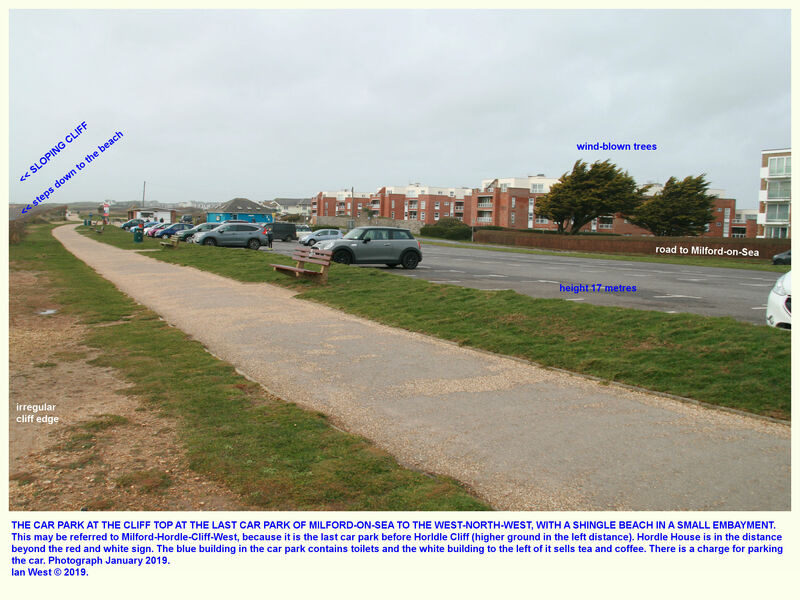 the westernmost of the Milford-on-Sea coastal car parks. 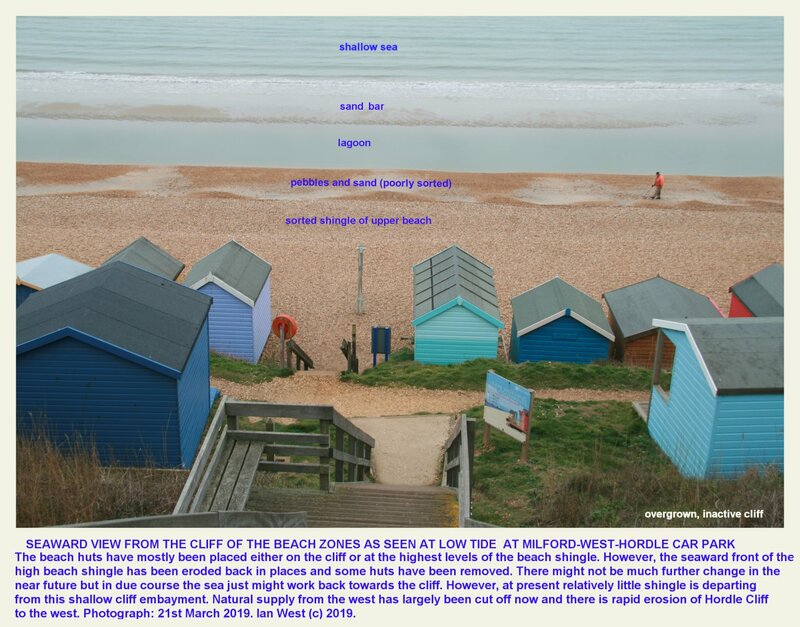 It shows the present cliff features, including in general, vegetation and beach huts, were in existence in 1957. However, the beach was much wider. 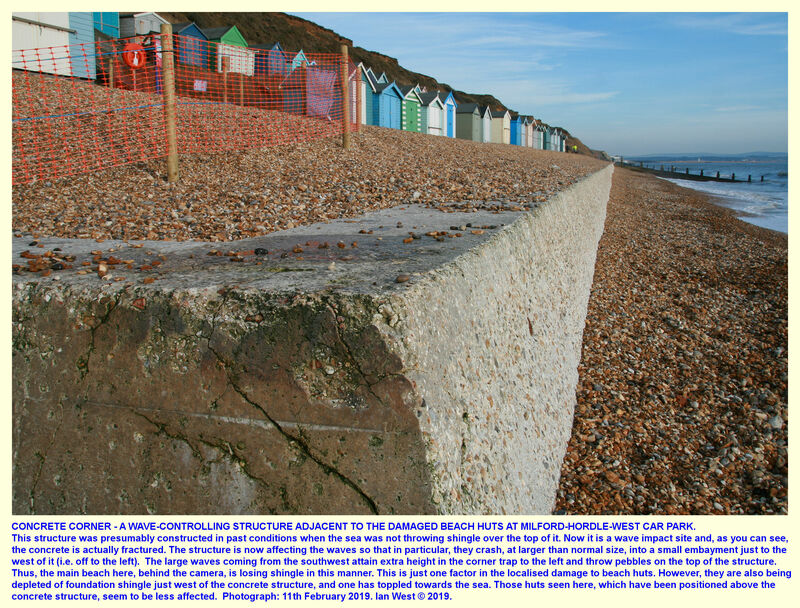 Towards the east-southeastern end of the shingle beach at the Milford-West-Hordle car park there is a concrete sea-wall. The corner of this wall (i.e. the west-south-western end) is a good indicator of the extent of erosion that has taken place. Drastic changes have been seen within a few days or a week or so. 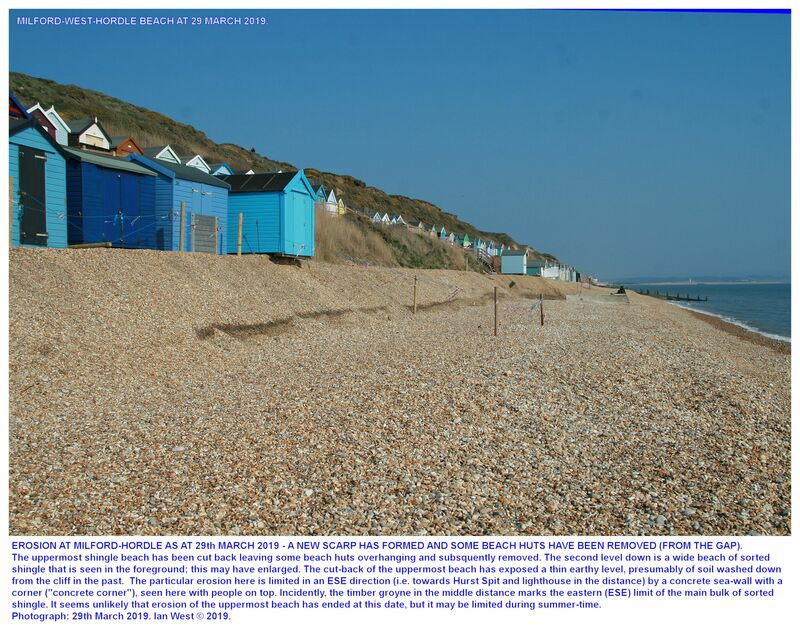 It is very unfortunate for the owners of beach huts that several, perhaps many, have had to be removed because the shingle was being eroded away from beneath them. At least one has toppled down onto the lower level of the beach. Sooner or later there will be relatively few beach huts left at the east-south-eastern area of the beach here. 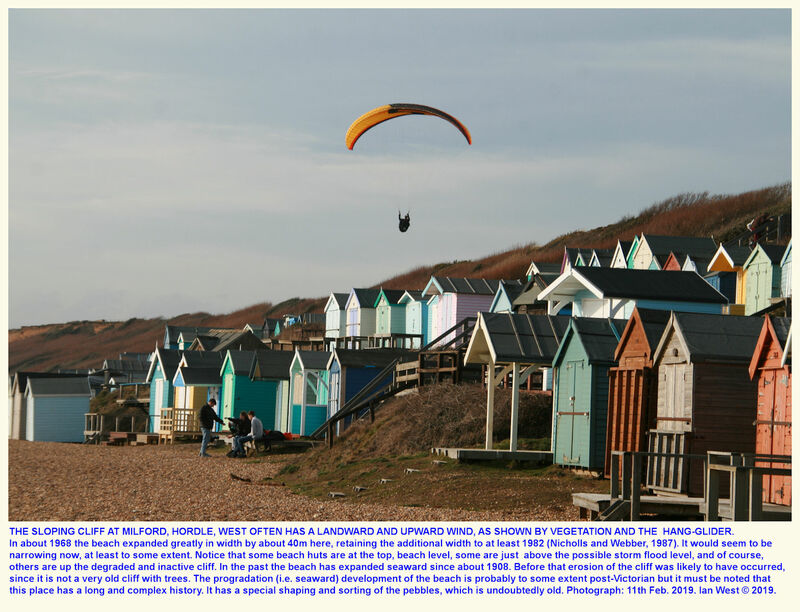 Hordle Cliff is well-known as a place of historic coastal retreat; in fact the whole village of Hordle has been moved inland as a consequence of this. In recent times, though, there has been some substantial accumulation of beach shingle in the area near the Hordle Cliff West car park and there has been little coastal retreat just there (but much in the Taddiford - Becton Bunny area, further west). 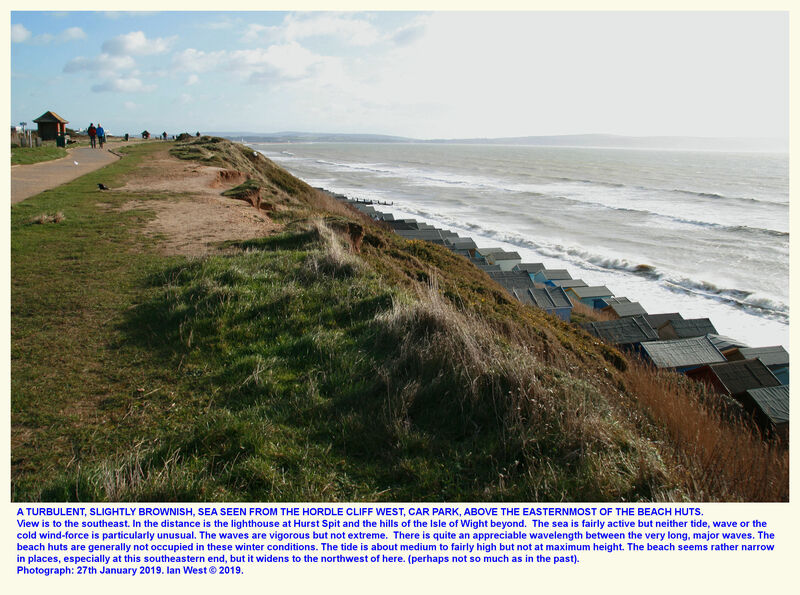 However, in 2018 and 2019 there seems to be a new phase of reduction of beach width near the so-called "Hordle Cliff West" car park, actually east of Hordle Clay. 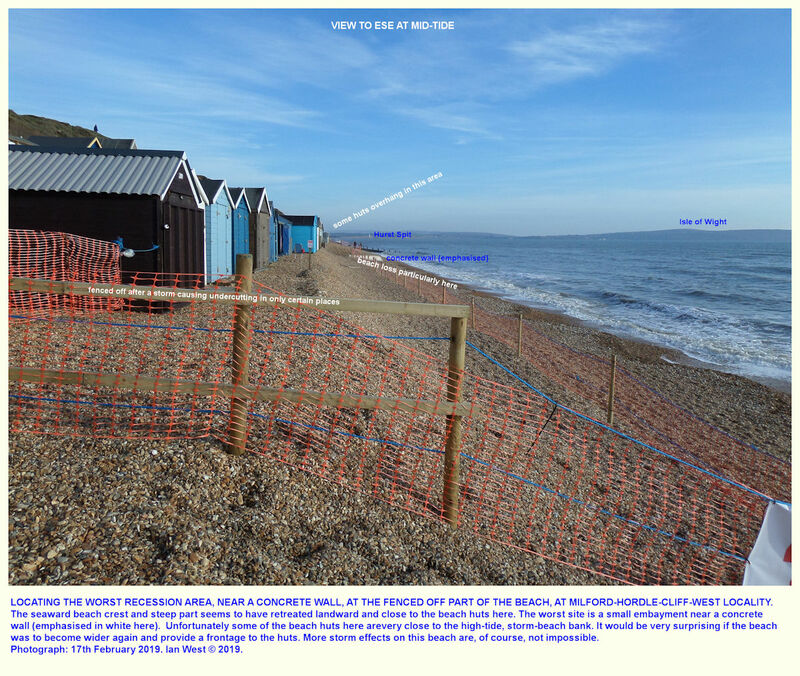 The beach reduction is marked near the eastern seaward corner of the car park, and near the eastern limit of the beach huts. A photograph above illustrates this. The erosional effects are limited at the moment, but some more landward retreat would not be surprising here. 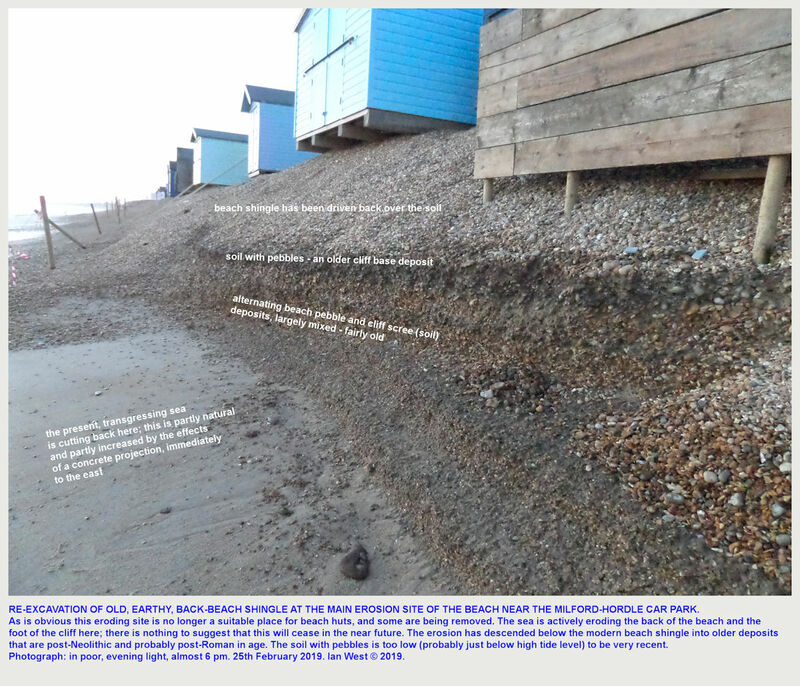 The matter is not simple because the erosion is close to the southeastern end of the large stretch of shingle beach without major sea defences. 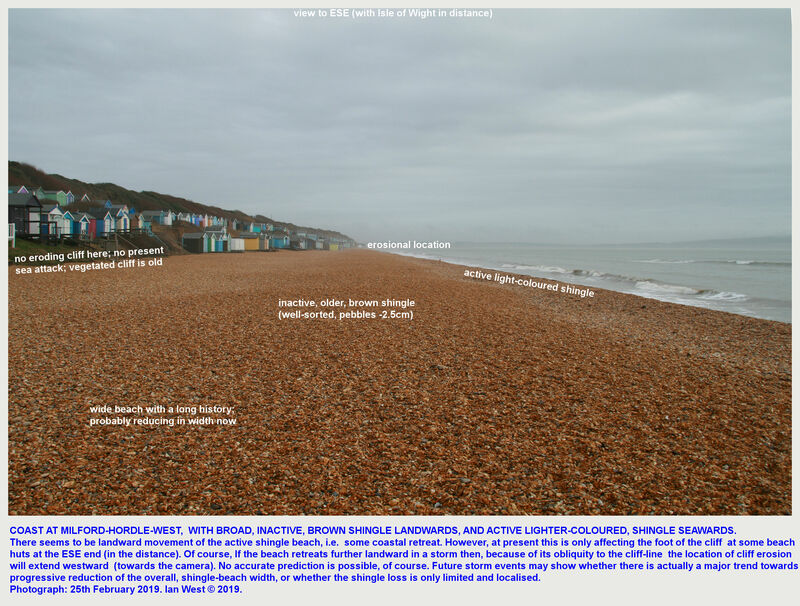 It might be expected that shingle, which moves in general from west to east by longshore drift, should accumulate near the projecting and presumably-retarding, concrete sea defences. However, it is not banking up on a large scale, but seems to be travelling on to some extent towards Milford-on-Sea (where there is now significant shingle accumulation). The matter is not, at present, fully understood here. 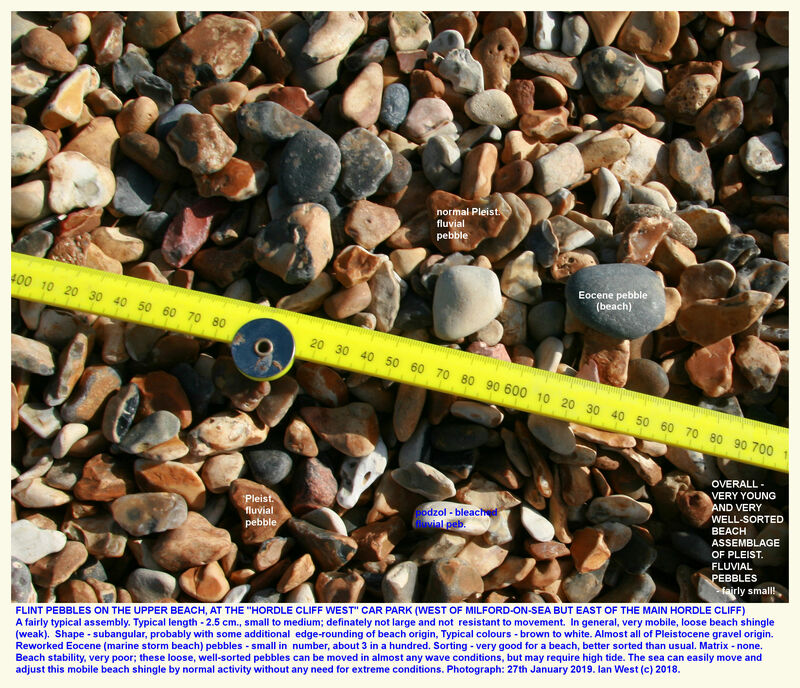 The pebbles adjacent to the beach huts near the "Hordle Cliff West Car Park" [i.e Milford West] are surprisingly small, about 2.5cm in length, for the area and the wave size. They are the usual material, i.e. reworked subangular, Pleistocene flint pebbles, and are very well-sorted. 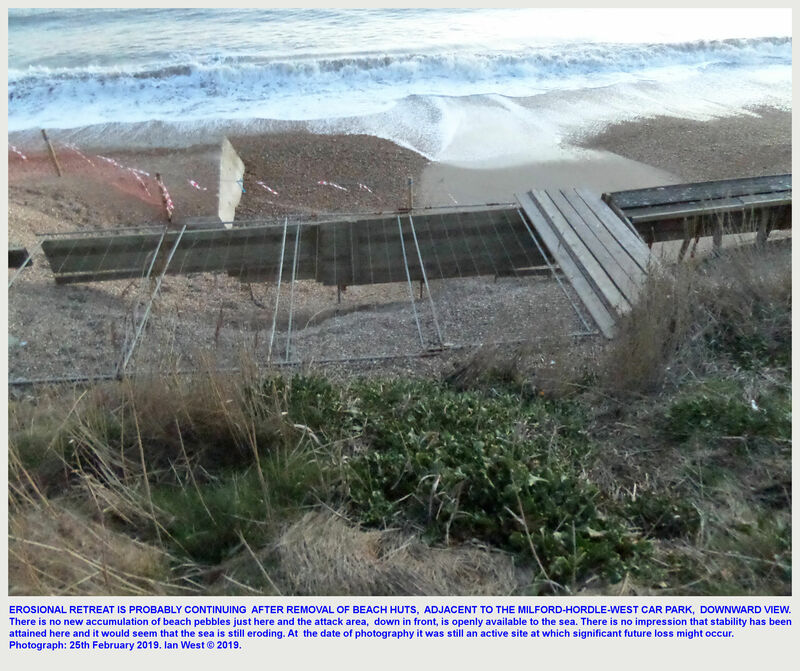 It is a reasonable to consider just how secure, re erosion, the foot of the cliff at "Hordle Cliff West Car Park" is likely to be in a decade or two. Obviously, the chances are better if a good pebble beach remains. It may not, necessarily, retreat any further, but no definate predictions on its future stability can be made. 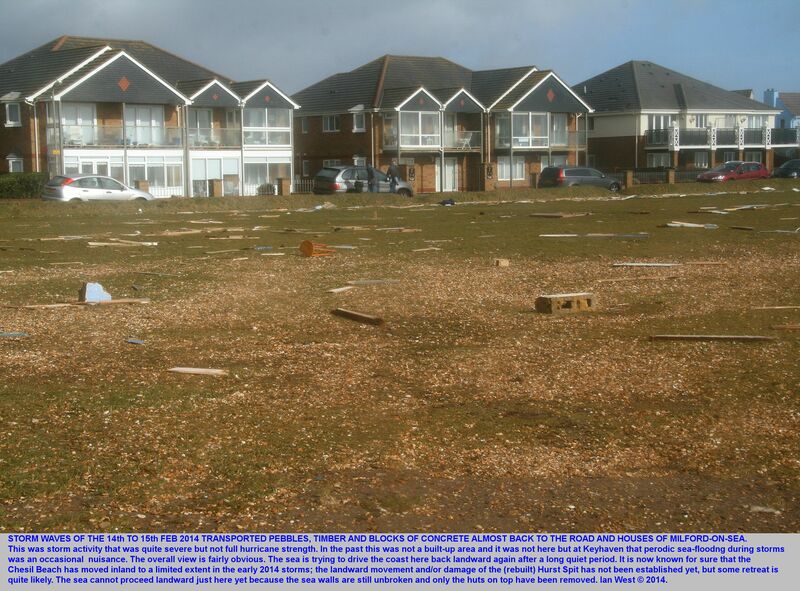 Timber beach huts have all been destroyed or removed, further west at Milford-on-Sea, seafront after the 2014 storm. However, they were in a relatively vulnerable position and they have since been replaced by rows of new concrete beach huts (see Milford-on-Sea webpage ). 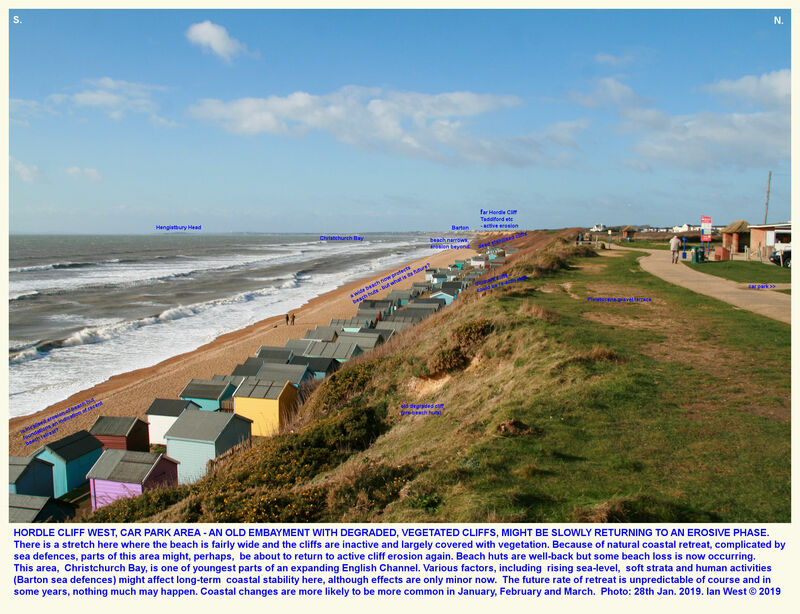 Presumably the huts near the "Hordle Cliff West" car park survived the 2014 storm, at least partly because of the particular natural protection given by the beach. 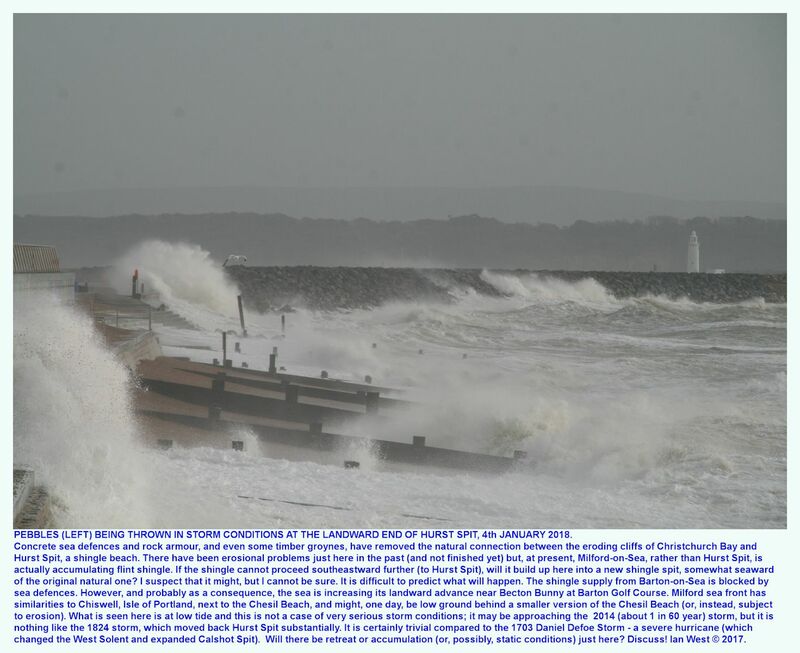 So, apart from the unusual concrete huts at Milford-on-Sea (and a few remaining timber huts, east of the White House) they are the most extreme easterly ones of Christchurch Bay [wave action can be potentially greater in eastern Christchurch Bay than western, because the southwestern waves arriving there from the Atlantic can easily pass Durston Head, Swanage]. 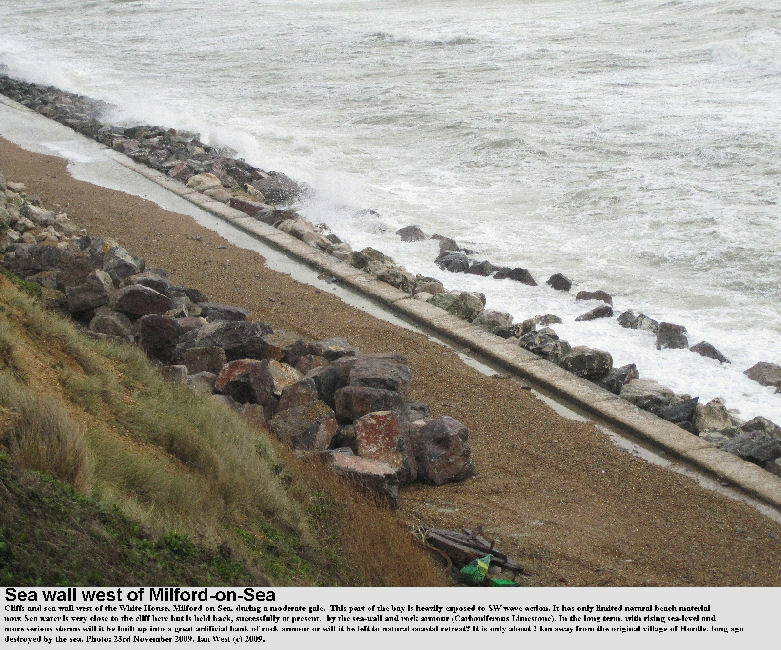 Milford-on-Sea, Erosion and Sea Defences). 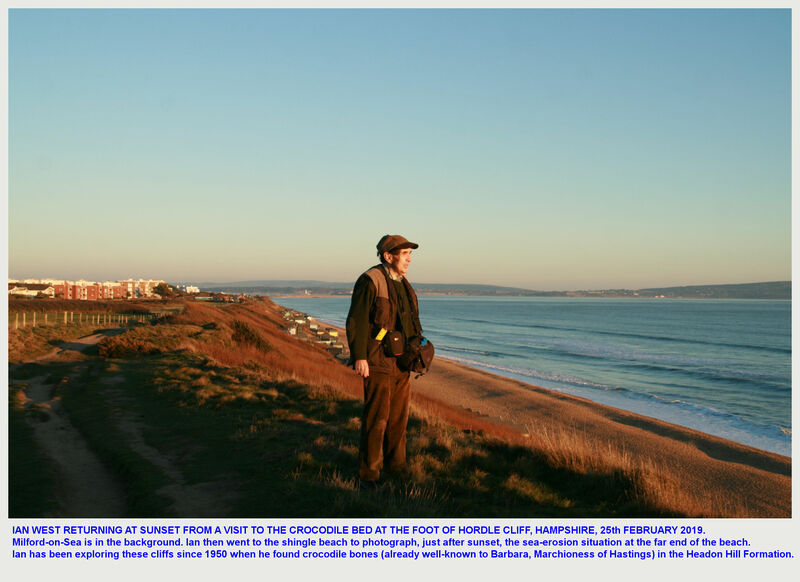 Compare the following two photographs, from the same place, west of Milford-on-Sea, as seen in 2003 and 2019. 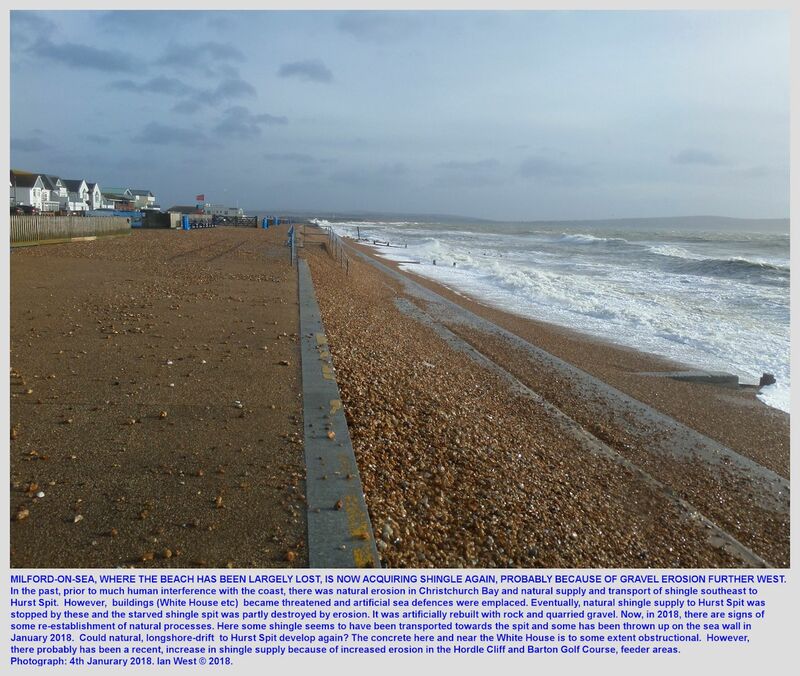 There has recently been some more landward movement of beach shingle up from the low beach and onto the high promenade, which is now largely covered in shingle. Some beach huts have been removed. Obviously the sea continues its advance, although this is here seen to have been at a moderate rate, not a particularly fast one. The rock armour is almost unchanged. Selected Extracts from - Lymington Times Newspaper, Friday 22nd Feb. 2019. 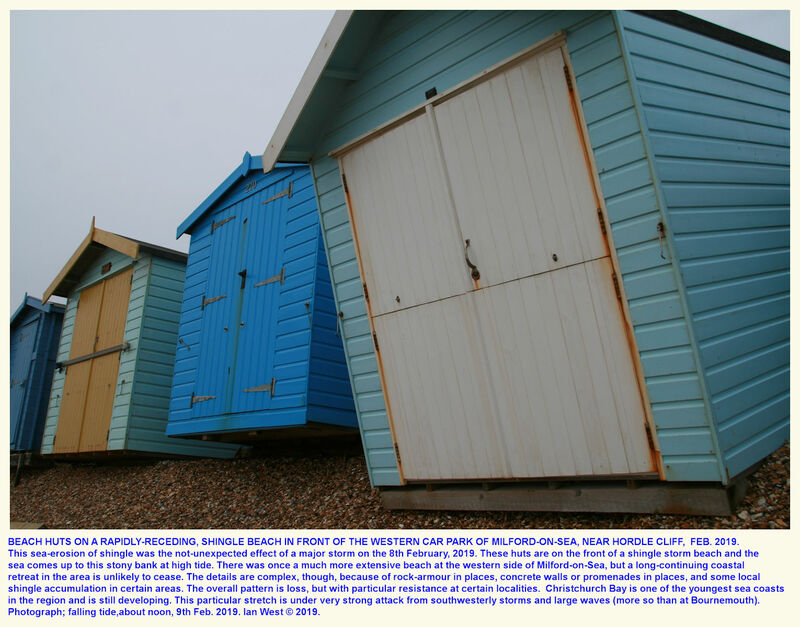 "Owner are furious after 20 beach huts worth thousands of pounds were ordered to be demolished by New Forest District Council. They have been instructed to take down the structures without compensation on part of the foreshore at Hordle Cliff, near Milford, where erosion has swept the shingle from underneath. The area has been cordoned off and four are deemed to be at such risk of toppling over that they have been condemned by the NFDC and given a week to be taken down. Sixteen more owners have 90 days to take action. Owners are angry at NFDC for not doing more to prevent the erosion and claim that they have been left at the mercy of the elements. 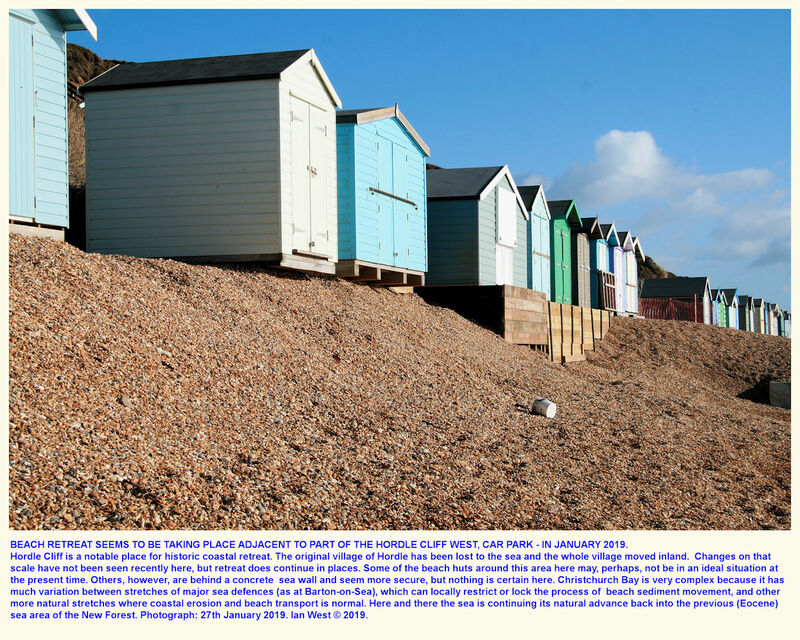 Some have suggested that space could be found nearby for them to move their beach huts. But the council says it has made people aware of the danger repeatedly in correspondence since several huts were destroyed by a storm in February 2014, and owners had to apply for planning permission to replace them. Fighting erosion there was "not economically justified", it said. ..... continues. 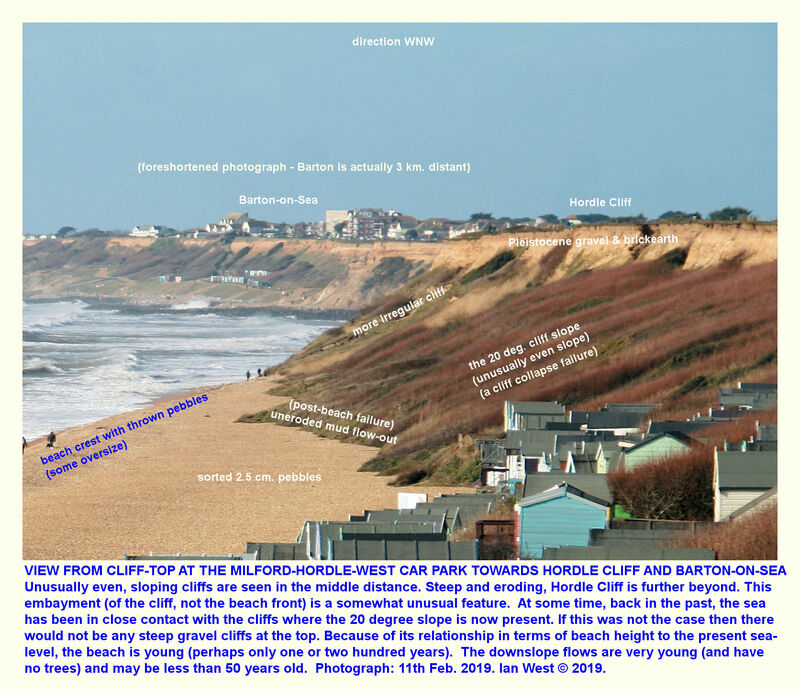 Between the Hordle Cliff car park at Milford-on-Sea and the Paddy's Gap car park there are small but interesting cliff exposures of the Unio Bed (No. 30) and associated strata. The shining, "mother-of-pearl" shells of the freshwater mussel "Unio" are common here, but often broken. They are not the most abundant fossils. Gastropods, particularlyViviparus lentus (Solander), are conspicuous in almost every unit here. The very small gastropod Potamaclis turritissima (Forbes) is easily recognised by its descriptive name, but almost needs a handlens to see it well. At the base of the fossiliferous beds in the cliff is a thin band with numerous seeds of the Water Soldier or Water Aloe. These were known in Victorian times as Carpolithes but are now placed in the genus Stratiotes. 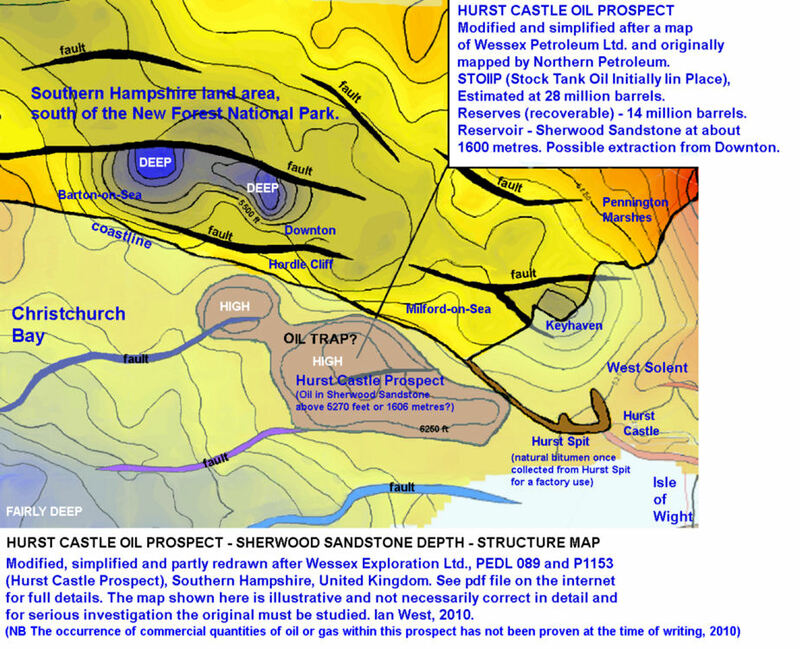 A preliminary structural map of the Hurst Castle Prospect at the Sherwood Sandstone level is shown. Estimated P10 oil-in-place is of the order of 190 million barrels for the Sherwood reservoir alone, with possible recoverable reserve of 36 million barrels. A separate structural map shows four-way dip closure offshore, with possible P50 recoverable reserves in the 16 million barrel range." ... [continues]. Nicholls, R.J. and Webber, N.B. 1987b. Coastal erosion in the eastern half of Christchurch Bay. In: Culshaw, M.G., Bell, F.G., Cripps, J.C. and O'Hara, M. (eds), 1987. Planning and Engineering Geology. 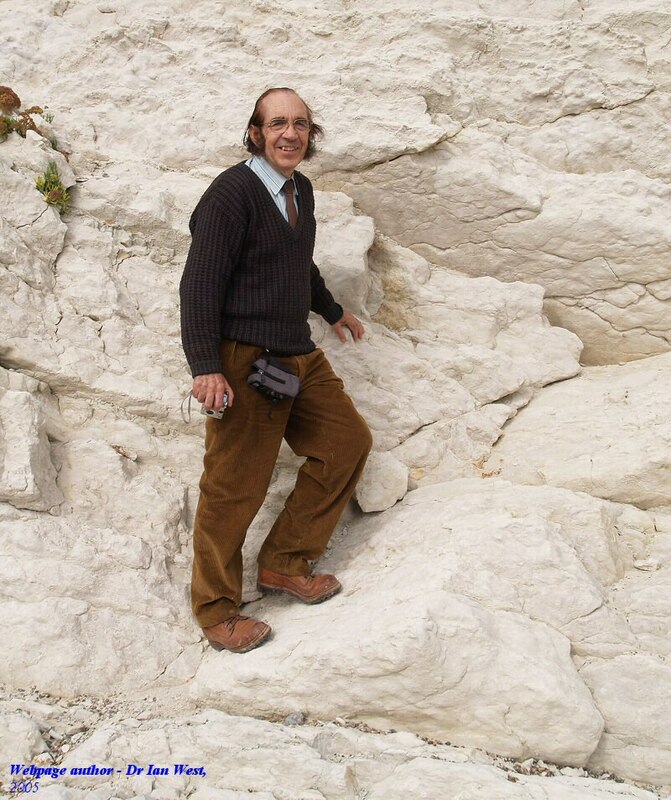 Geological Society, London, Engineering Geology Special Publication, No. 4, pp. 549-554. 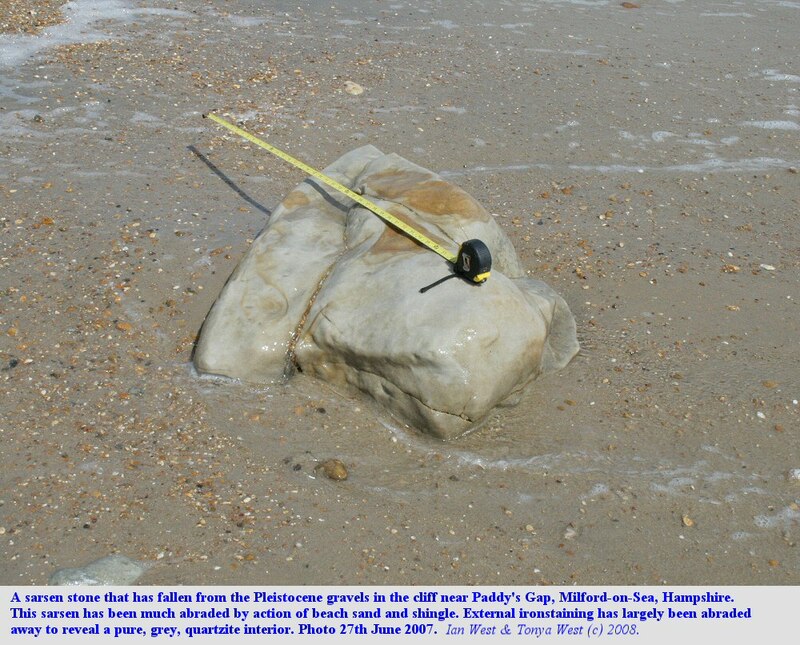 This paper discusses Hurst Spit before the natural feature was broken through and largely destroyed by storm erosion. 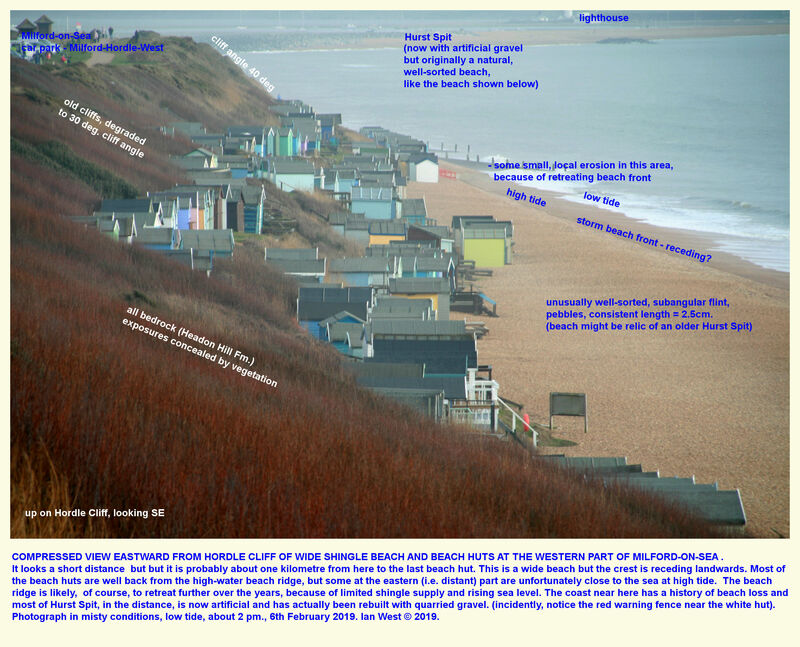 Although it is out-of-date now with regard to Hurst Spit, it contains subject matter, still relevant to the beach at Hordle. Fig. 4 on p. 552 shows movement (lateral movement, up and down beach) of high water mark from 1867 (used as a reference line) to 1982. 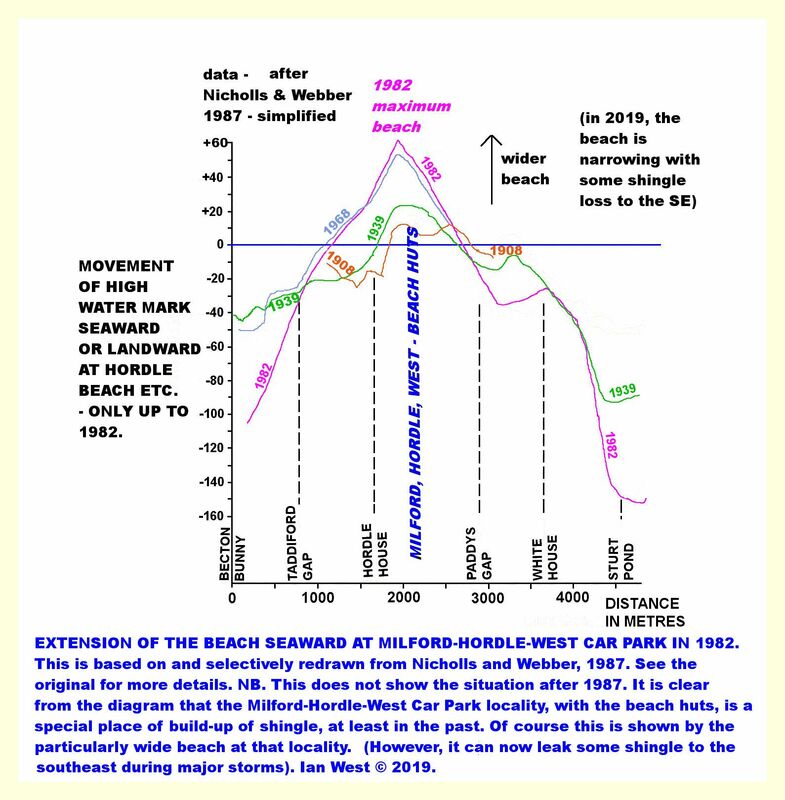 In particular, there was a major change shown peaking in 1982, of beach development at the Milford West Hordle car park. The beach had actually extended seaward (built-out) by 60 metres in 1982. This 1982 growth was the largest seaward development in the region. Because of the date of the paper, it is not clear as to what has happened since. (At the White House, there was retreat of the beach by 40 metres at the same date). 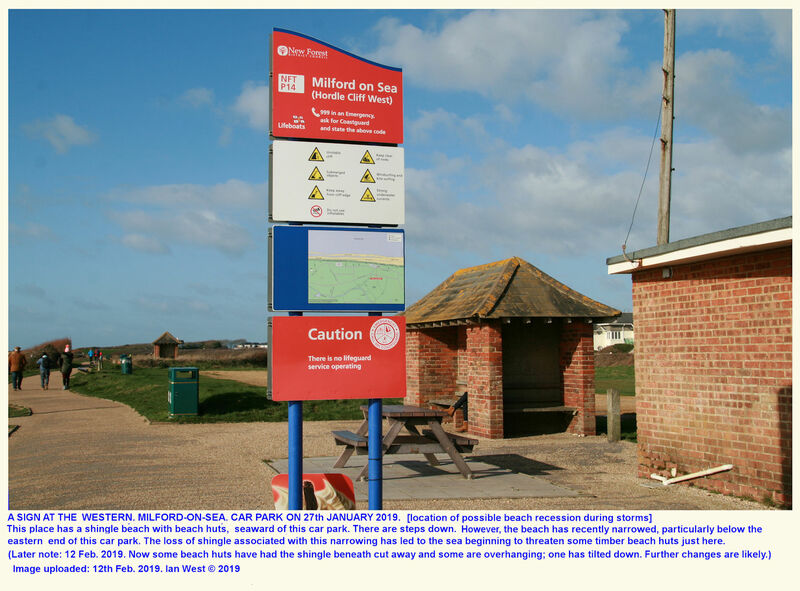 I am particularly grateful to Claire Osborne and Jan Wise for valuable information on coastal processes and coastal history in the Milford-on-Sea area. This is much appreciated. Abstract: Christchurch Bay has a long history of shoreline recession and this has given rise to some major coastal engineering problems. An area of particular concern is Hurst Spit at its eastern end where the maximum rate of recession has increased from 1.5 metres per annum (1867-1968). Hurst Castle itself is now subject to wave attack on part of its frontage. The littoral sediment movement was assumed to be essentially continuous around Christchurch Bay [it certainly is not now! 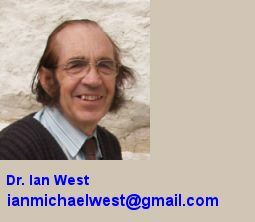 -imw] but, in fact, a littoral drift sub-cell boundary (i.e. a partial barrier to littoral drift) is present in the vicinity of Hordle Cliff. Therefore, the increased recession of Hurst Beach is a local problem. 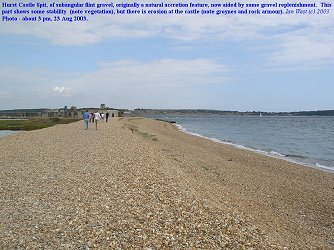 Milford-on-Sea is situated on a thick sequence of Pleistocene Gravels, whose erosion contributed substantially to the maintenance of Hurst Castle Spit [Hurst Spit] as a major physiographic feature. However, a series of coast protection works were constructed to protect Milford-on-Sea between 1936 and 1968, removing this important source of sediment. In the long term, without any human interference, recession rates upt 6m per annum will probably occur along Hurst Beach. 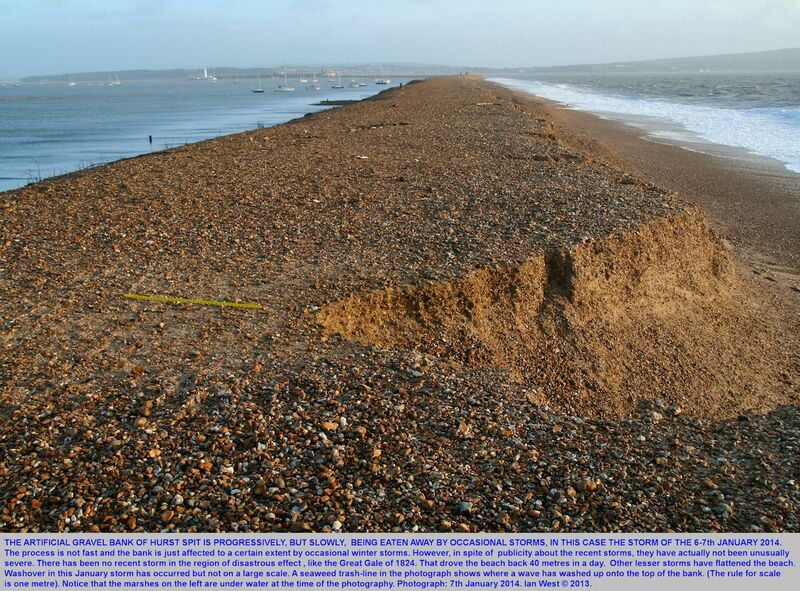 A breach of Hurst Beach is a major concern, as it would create an island at Hurst Caste and expose the vulnerable low-lying, northern coast of the West Solent, including the village of Keyhaven to increased wave attack and tidal scour. Ecologically important saltmarshes would also be destroyed. Shingle renourishment is the only environmental acceptable engineering solution. Limited renourishment has already commenced. 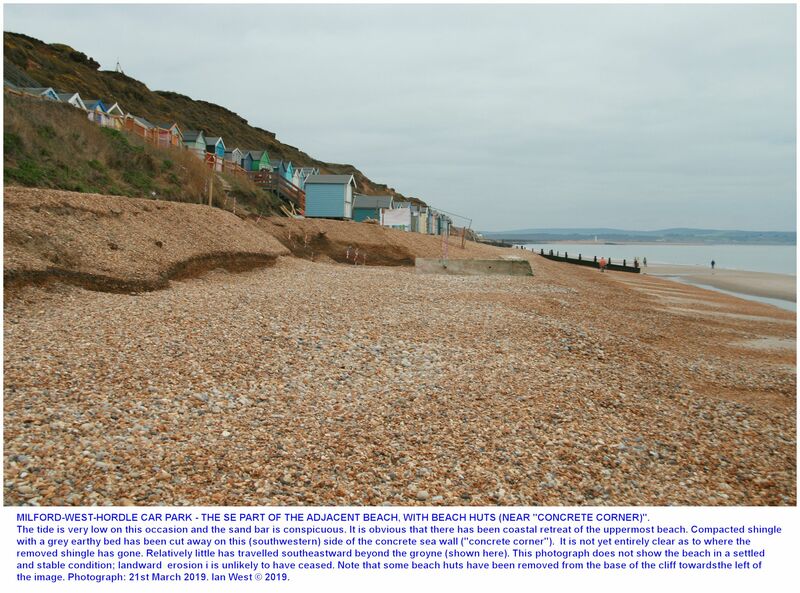 Any cost benefit decisions must consider the wider implications of a breach in Hurst Beach, including environemental and ecological considerations. This case study demonstrates the importance of a detailed understanding of both the littoral and offshore sediment movement for the planning coast protection.